ç To find what was done in each day, select the month you want to see and then select which category you want to check out. Incubation at 37 °C over night. Bacteria grew and single colonies were visible. 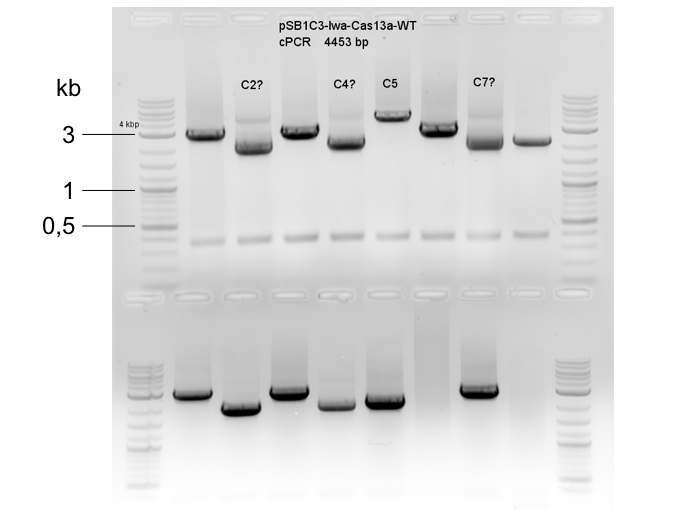 Electro transformation of p2CT-His-MBP-Lbu-Cas13a-WT and p2CT-His-MBP-Lsh-Cas13a-WT in E. coli Rosetta. 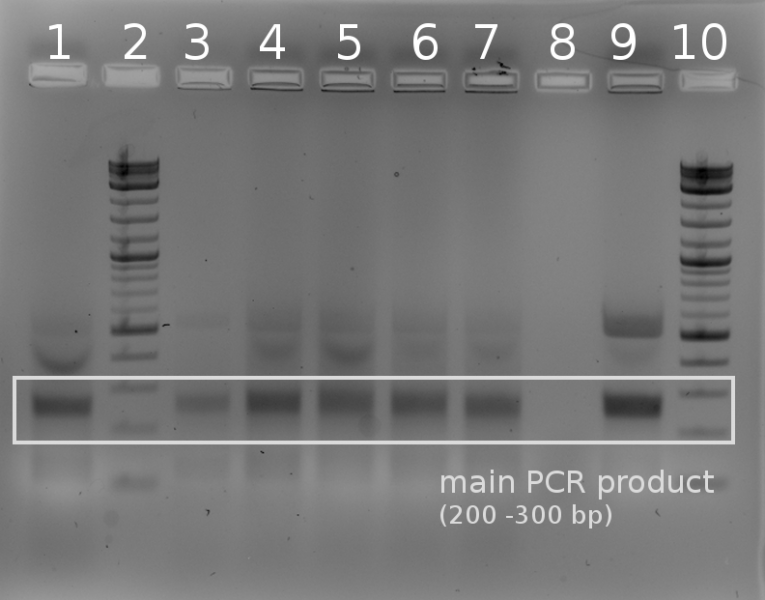 1 µl of plasmid DNA was used. Bacteria were plated on LBCarb plates without additional Cm. Bacteria lost second plasmid probably. 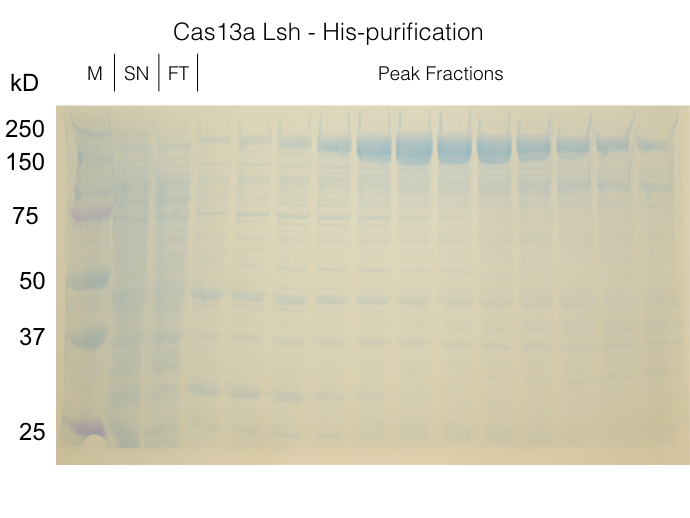 Preparations of buffers for Cas13a purification. TCEP changes the pH. Readjustement after adding neccessary. Bacteria grew, but only few single colonies were visible. This time bacteria grew well and a lot of single colonies were visible. 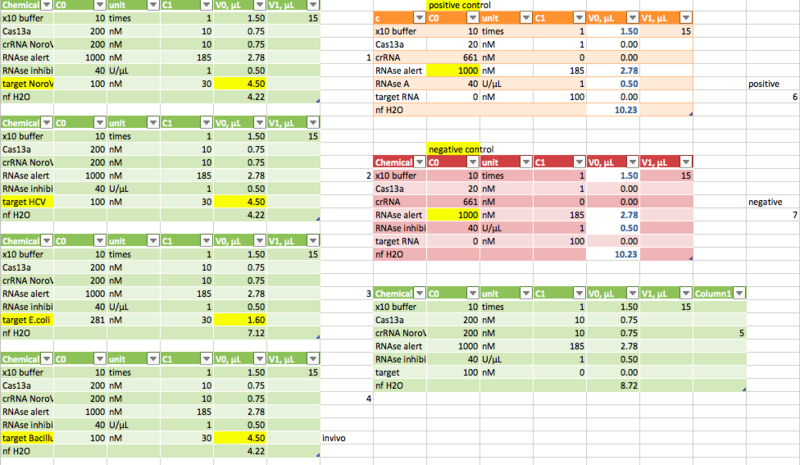 Preparation of 25 ml LBCarb + Cm cultures of Rosetta p2CT-His-MBP-Lbu-Cas13a-WT and Rosetta p2CT-His-MBP-Lsh-Cas13a-WT and incubated at 37 °C overnight. Bacterial pellets were stored at -80 °C. One test sample was run on the Äkta before the actual run. 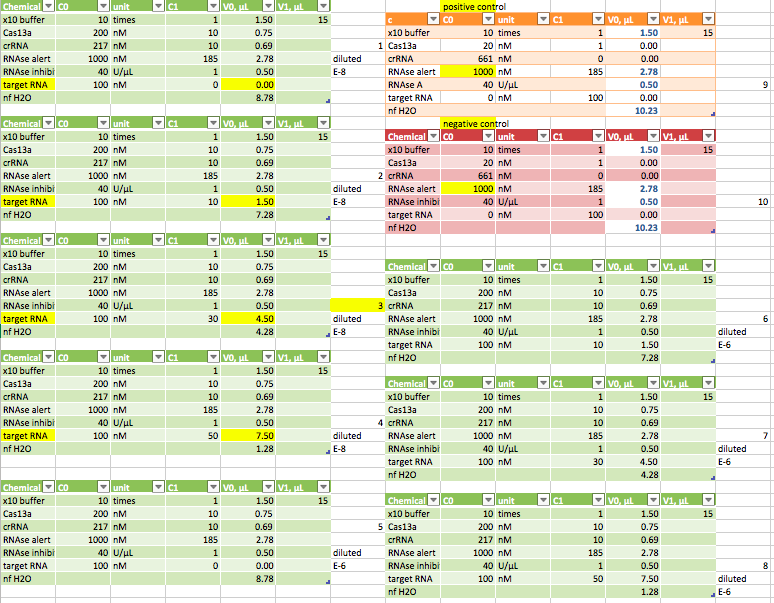 Only the second run was analyzed with a SDS PAGE. 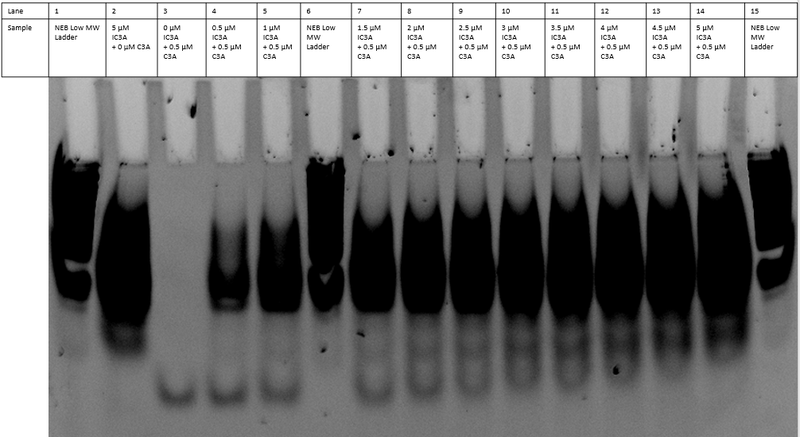 Three lysis methods were used: sonifcation, lysozyme digestion and heat lysis in SDS. Lysozyme digestion: According to protocol. Heat lysis: Sample was incubated in 2% SDS at 75 °C for 15 min. 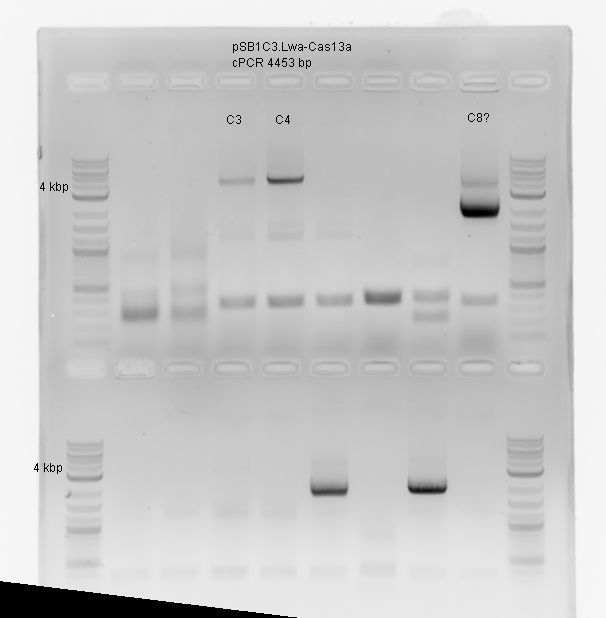 See results from "Phenol/Chloroform purification of RNA from in-vitro transcription" from 11.05.17 for gel picture. 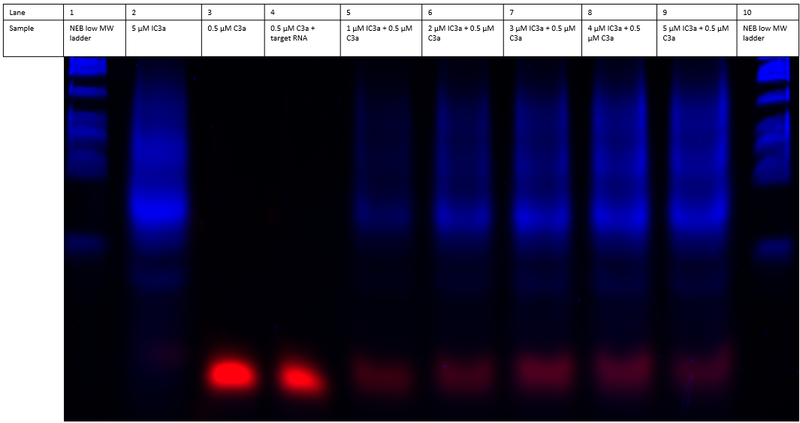 Test of different lysis methods for Phenol/Chloroform total RNA extraction. 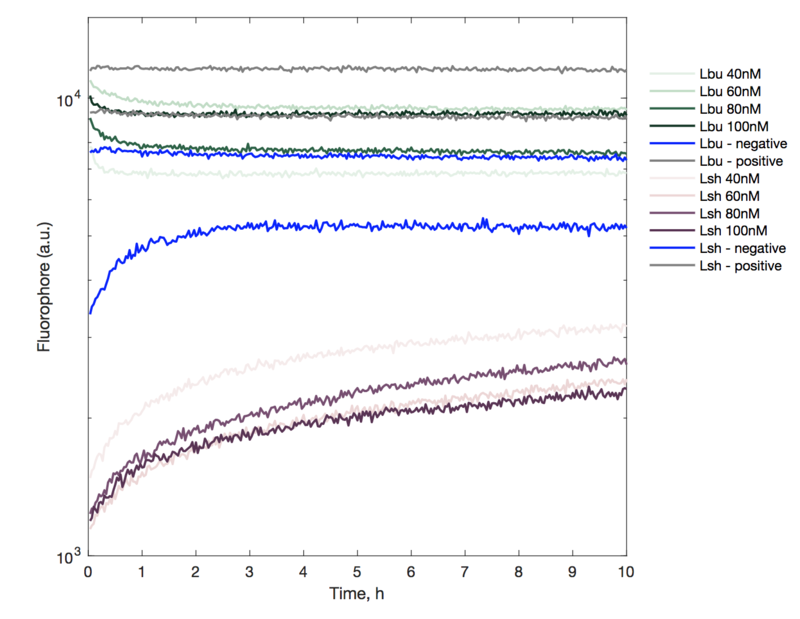 Three lysis method were used: sonification, lysozyme digestion and heat lysis in SDS. 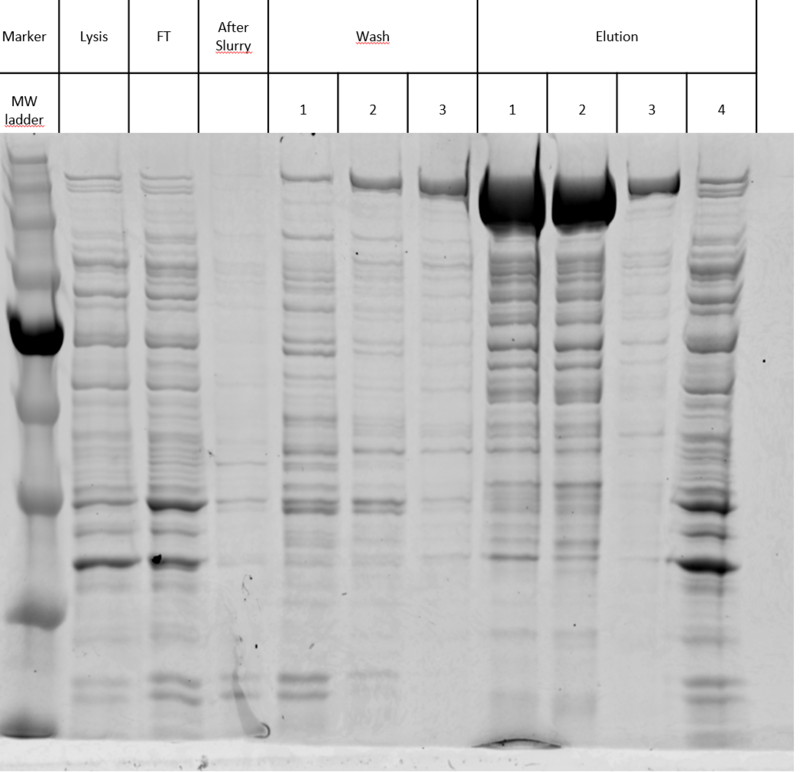 Lysozyme digestion: according to the total RNA purification with Norgen Kit protocol. The samples were incubated at -80 °C overnight and the purification finished the next day. See results from "Phenol/Chloroform purification of RNA from in-vitro transcription" from 11.05.17. Next day: Only a few colonies. 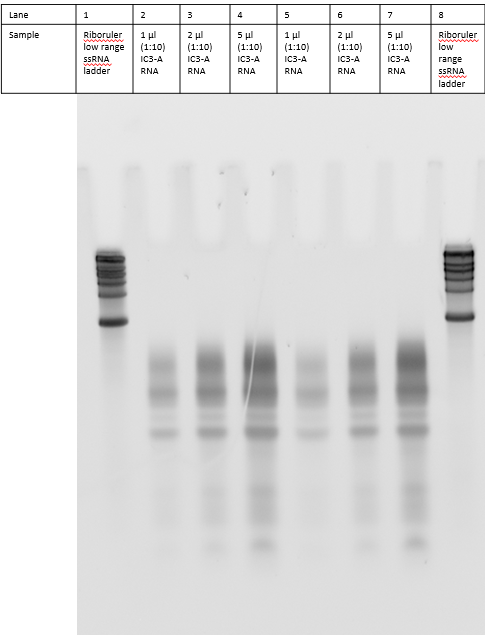 Instead of using TE and lysozyme to lyse the cells, they were resuspenden in 2% SDS in TAE and incubated at 75 ºC for 15 min. Three lysis methods were used: Alkaline Lysis, heat lysis with SDS and Trizol-Lyse. 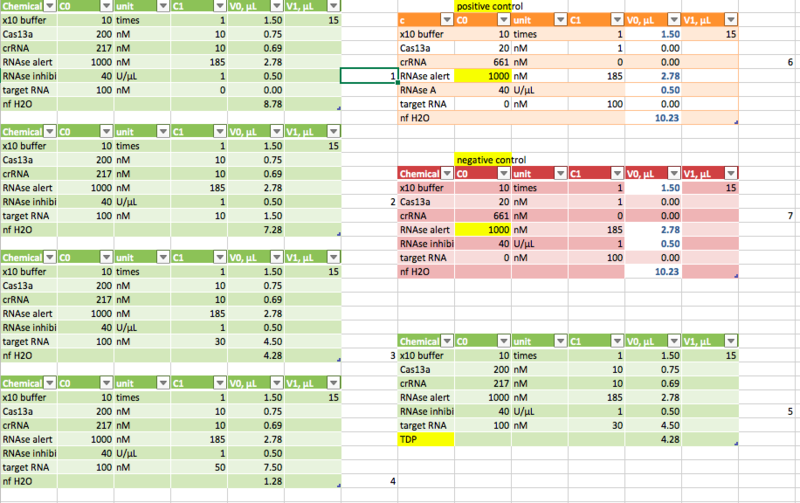 angle 45°, extract top phase carefully -> discard everything else, prot & DNA -> which Vol for the TRIzol aqueous phase? Aditional step, because RNA pellet was not entierly spinned down: Centrifugation (16000 rcf, 5 min, 4 °C) big-pellet assay in fridge, but 1. interphase was punctured/gel(DNA?) stuck to pipette 2. s.u. 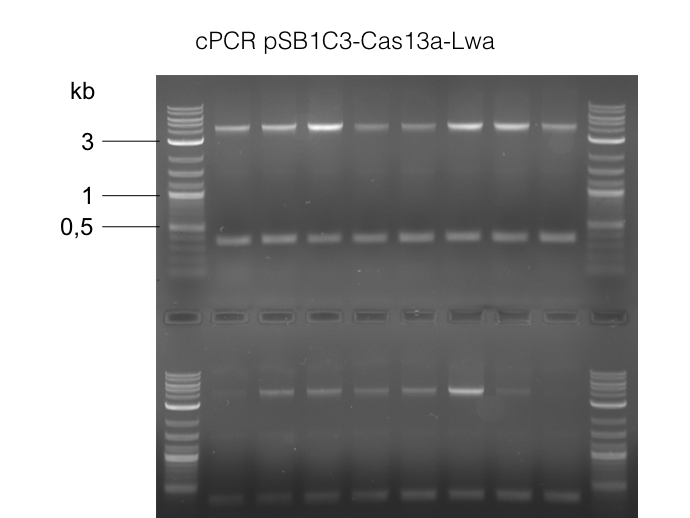 The Cas13a proteins were activated and cleaved the aptamers. This resulted in a decrease in fluorescence intensity. 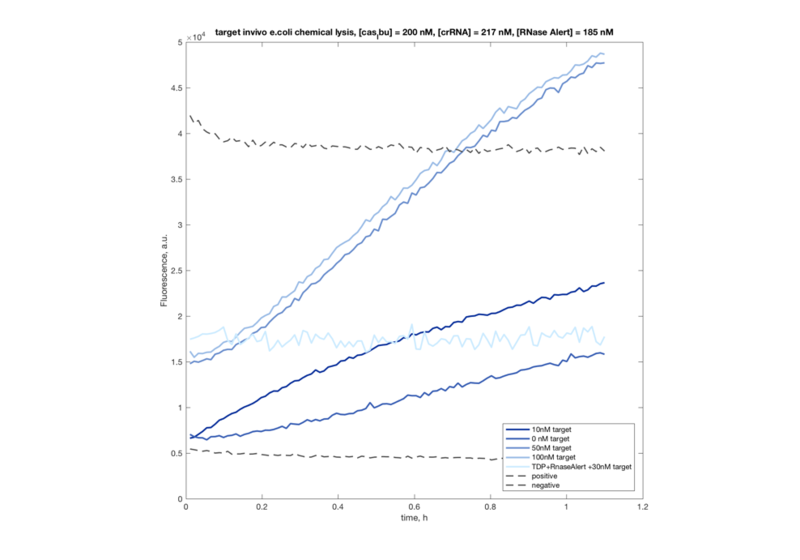 Measured [RNA] by Implen Nanophotometer (20170616). 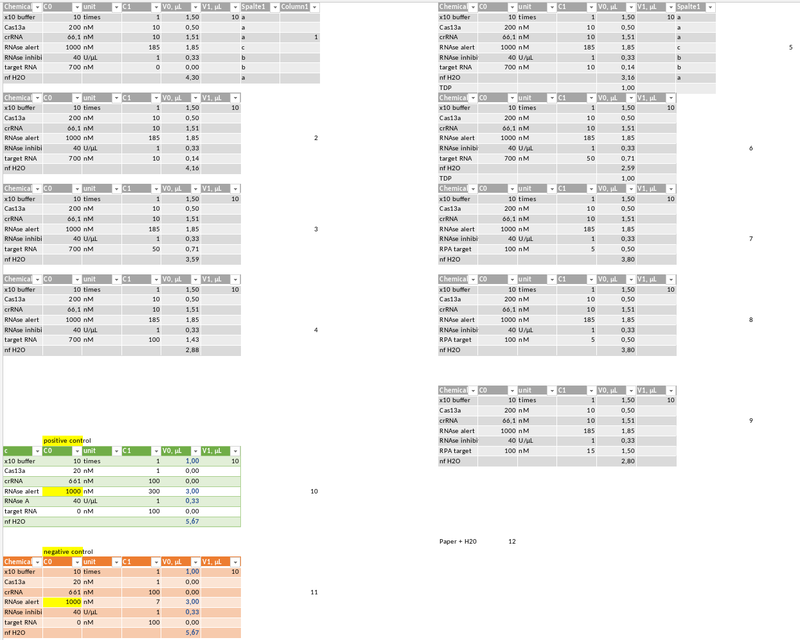 Repeated PCR of beta-Gal N and C Terminal fragments from 31.7. Patch length correction was on in the plate reader. Calibration for the plate reader experiment done with LUDOX and Fluorescein. We saw no difference between LUDOX and water when measuring at an OD of 600 nm. 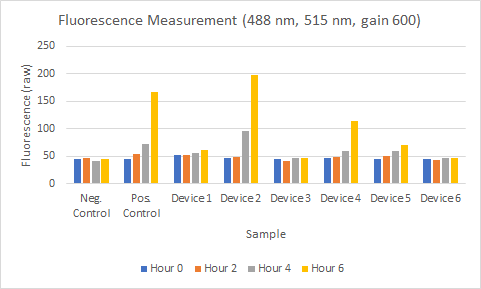 For the fluorescein measurement, the best gain was 600 using 485 nm/520 nm. 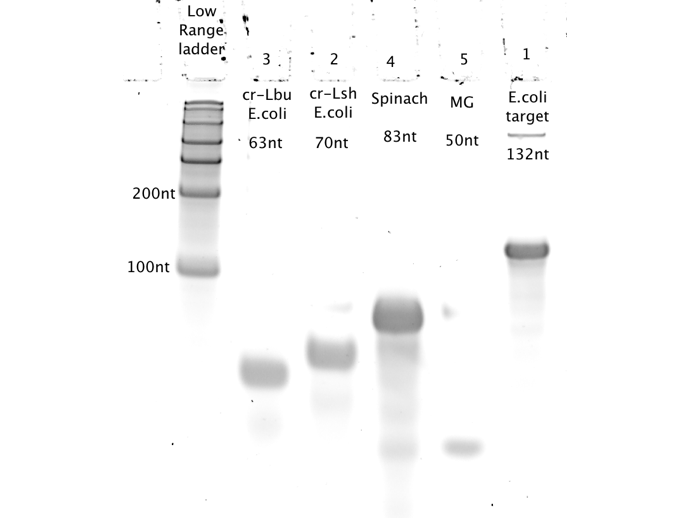 Plasmids from the plate 7 (positive and negative control, and devices 1-6) were resuspended. 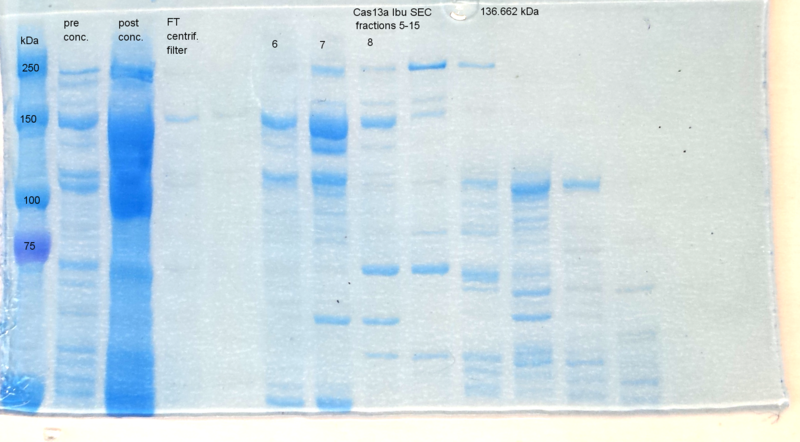 PCR with undiluted extracted DNA didn't work. Each plasmids was transformed two times: with chemical transformation and with electroporation, for a total of 16 plasmids. Every plate except the ones for Device 1 had colonies. Tested different concentrations of fluorescein in a 3D printed 96 well plate on paper. 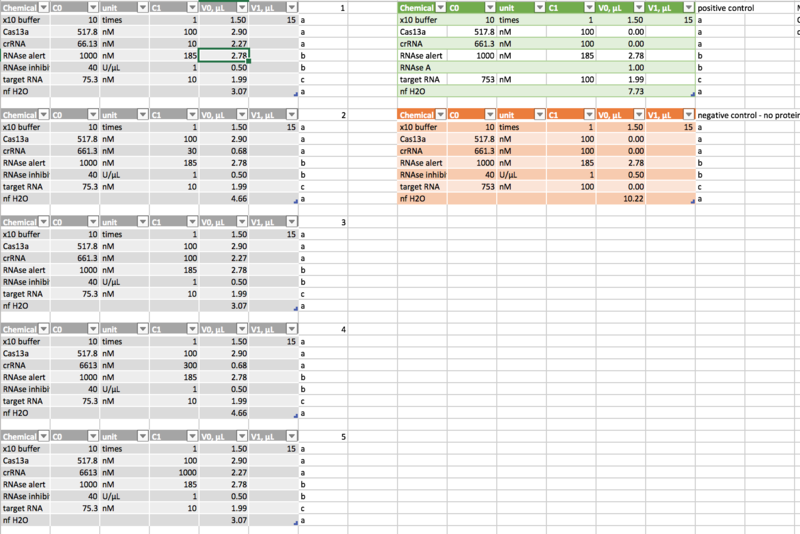 Scanned at differnt gains at a constant focal height. Device 1 was again transformed, as no colonies grew on the plate. Liquid cultures for the 7 plasmids whose plates showed colonies (all except Device 1) were made in duplicate. The plates were stored at -4 °C. 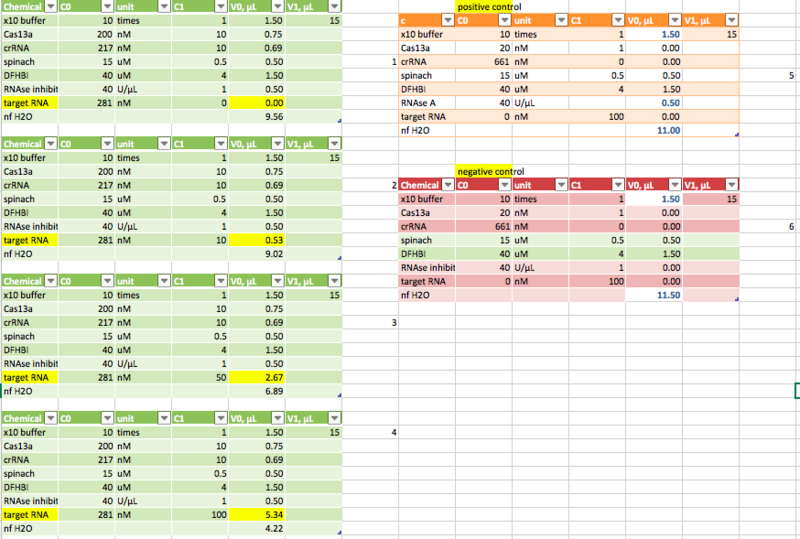 After measuring the OD600 of the O/N cultures, they were diluted with LB+Cm to an OD600 of 0.02, in duplicates. 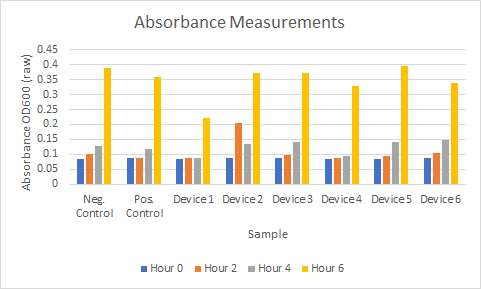 The absorbance and fluorescence of the diluted cultures were measured at 0, 2, 4 and 6 hours after the cultures were set. Transformation of Device 1 was successful. 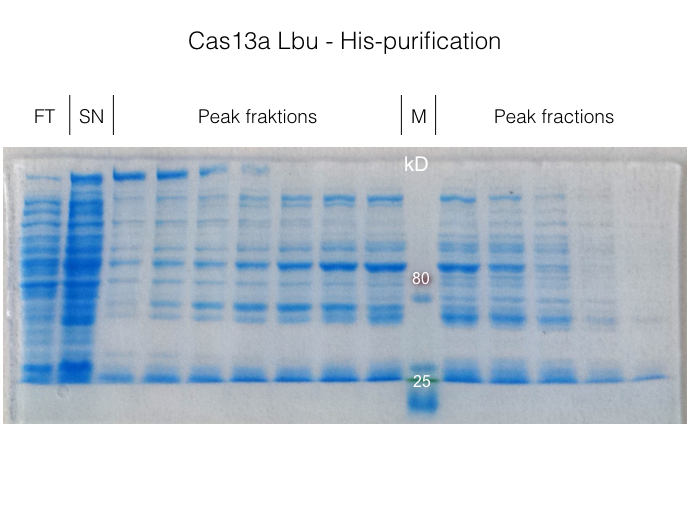 His purification of Cas13a Lbu according to protocol. Elution in 4 times 4 ml. ON Dialysis with TEV protease in 2 litres of Lysis buffer. O/N liquid cultures in duplicate were set up from all 8 Devices. 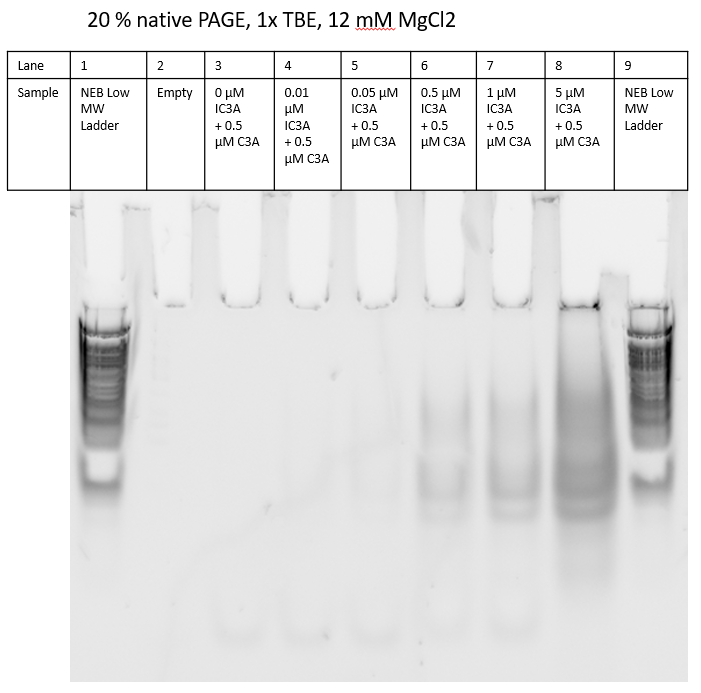 See Gel image of 14.8. for results. Phenol-Chloroform with the wrong pH was used. Sample was lost due to the use of the wrong Phenol-Chloroform solution. Patch length correction was off in the plate reader. We saw the difference in measurements between LUDOX and water. 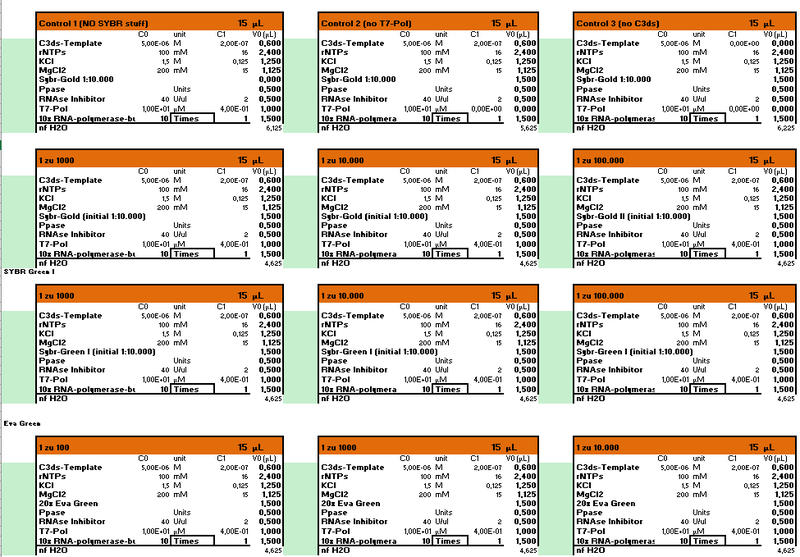 IC3A has a length of 33 bp = band on top. 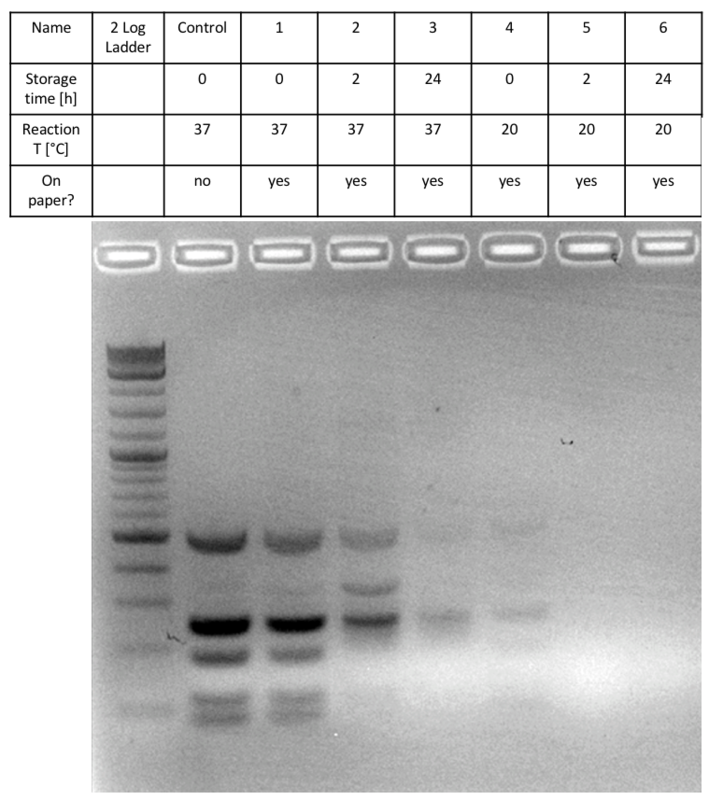 Incubation at room temperature for 1 h of DNA and RNA with varied concentrations of IC3a (RNA). 4% Agarose does not seem to work for separation. No oligos at all visible after staining with SybrGreen II and SybrGold. 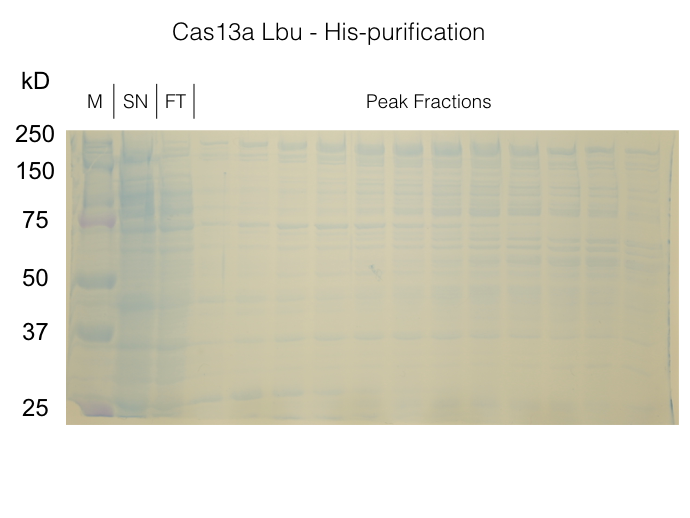 Purification of Cas13a Lbu according to protocol. Elution in 4 times 3 ml elution buffer. 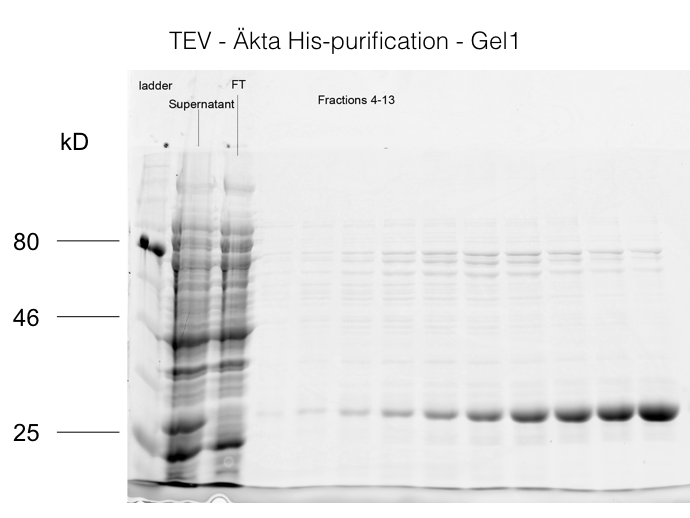 As visible on the gel the elutions 1 and 2 contained the highest amount of protein and were pooled for the TEV cleavage. 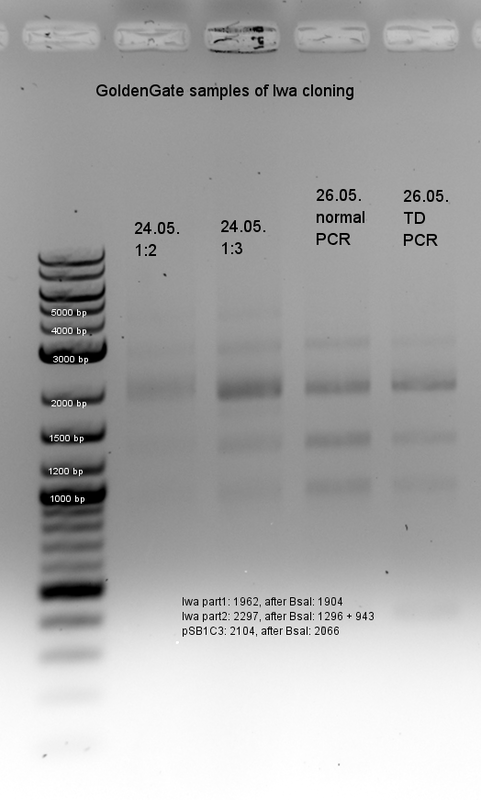 The gDNA was pre-purified with the Phenol/Chloroform method. 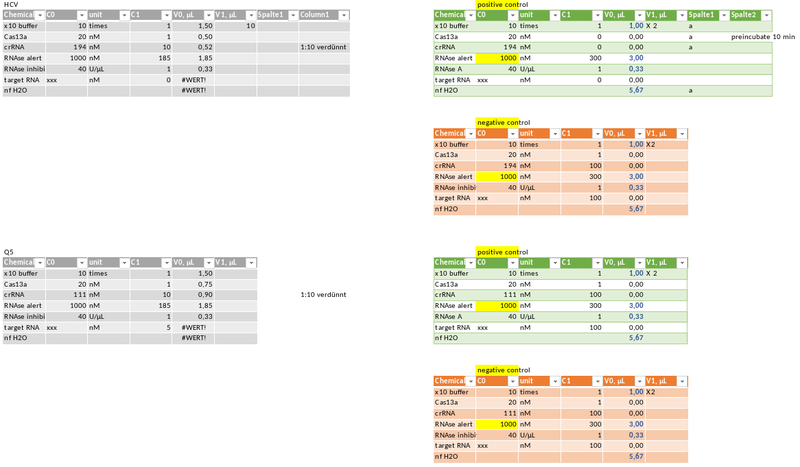 The gDNA solution was diluted 1:100, 1:1000, 1:100000, 1:10e6 and 1:10e8. Each dilution was then used as a sample for the FINA extraction. From each dilution, two extractions were performed. One as in protocol (1N-5N), the other without the NaOH washing step (1-5). 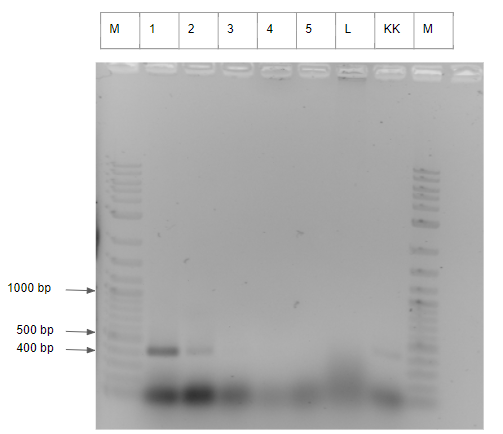 As negative control (KK) FINA extraction was performed as in protocol with nuclease free water as sample. For the membranes, no template was directly pipette. Instead, the membranes were put in the tube. 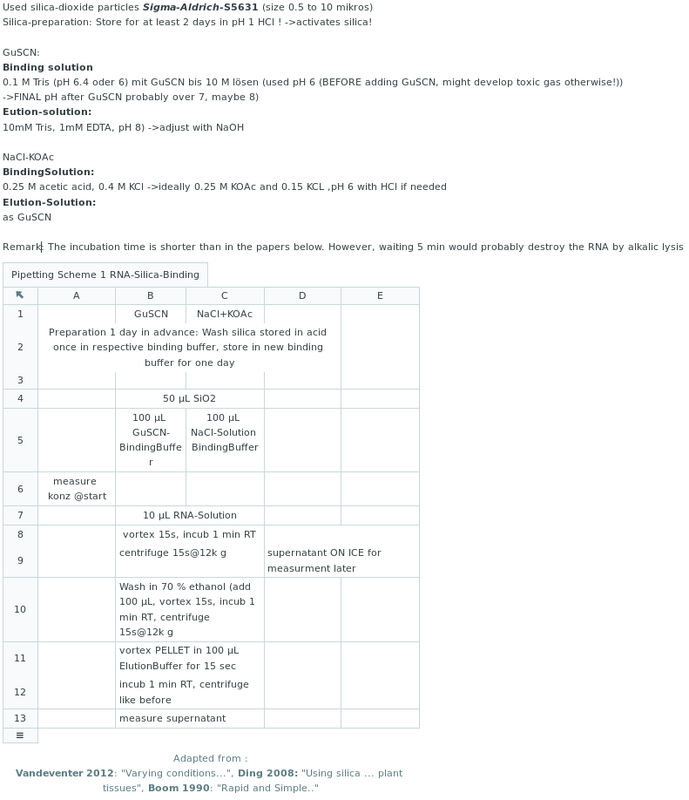 1N-5N: 1:100-1:10e8 dilutions FINA extraction performed as in protocol. 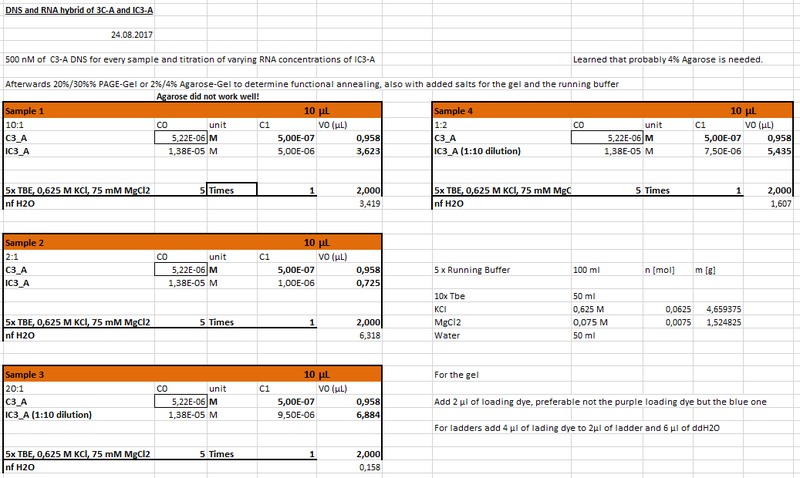 1-5: 1:100-1:10e8 dilutions FINA extraction without washing step. KK: negative control for FINA extraction (nuclease free water as sample). The extraction was done when the culture had an OD600 of 1.2. The cells were diluted 1:1, 1:100 and 1:1000 before the extraction. 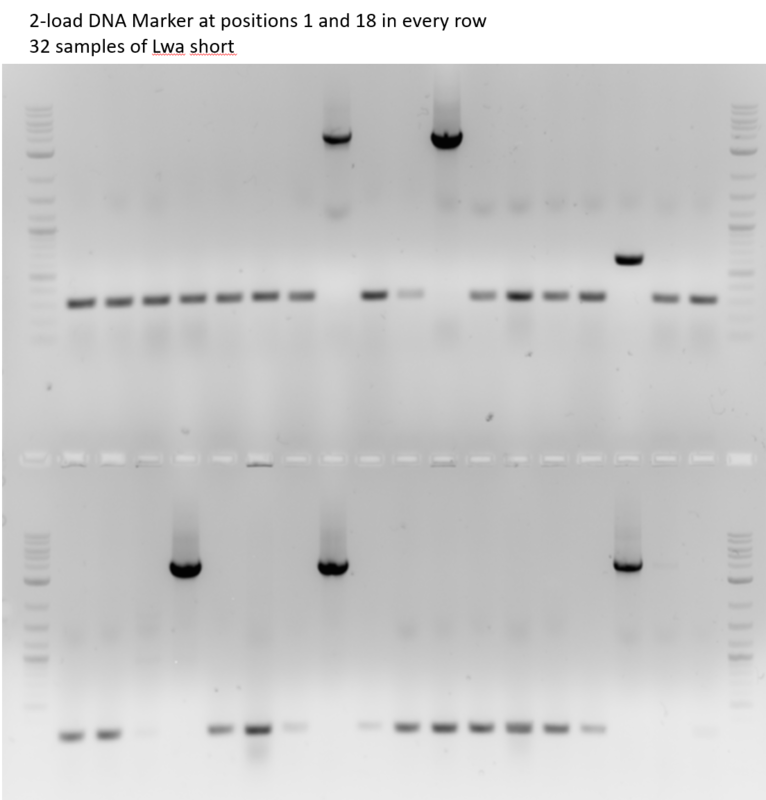 Each dilution was used as sample twice: as in protocol (1N-3N and P1N-P3N) and washed with 300 ul lysis buffer from RNA extraction kit (Norgen, P/N 17200) (1G-3G and P1G-P3G). Membranes 1N-3N and 1G-3G were put in 40 ul nuclease free water and incubated at RT for 10 min in order for the bounded DNA to go into solution. 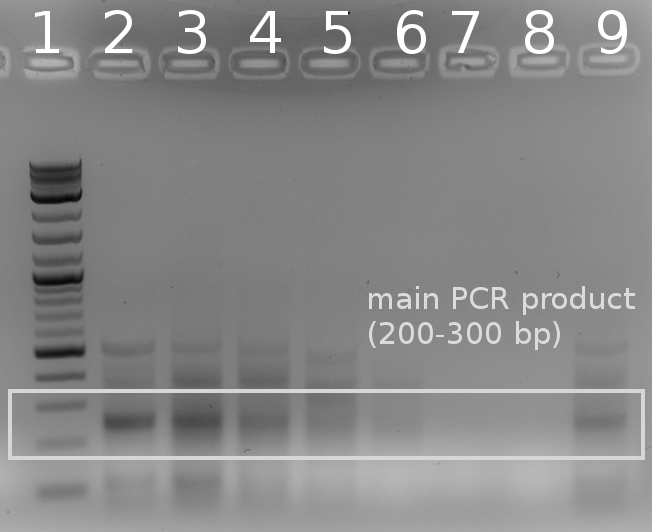 The membranes from the FINA extraction were directly put into the PCR-mix. No template DNA was directly pipetted. p-bGal_N_N was used as forward primer. p-bGal_N_C was used as reverse primer. Annealing was performed at 61 ºC. The amplification step was 90 s long. 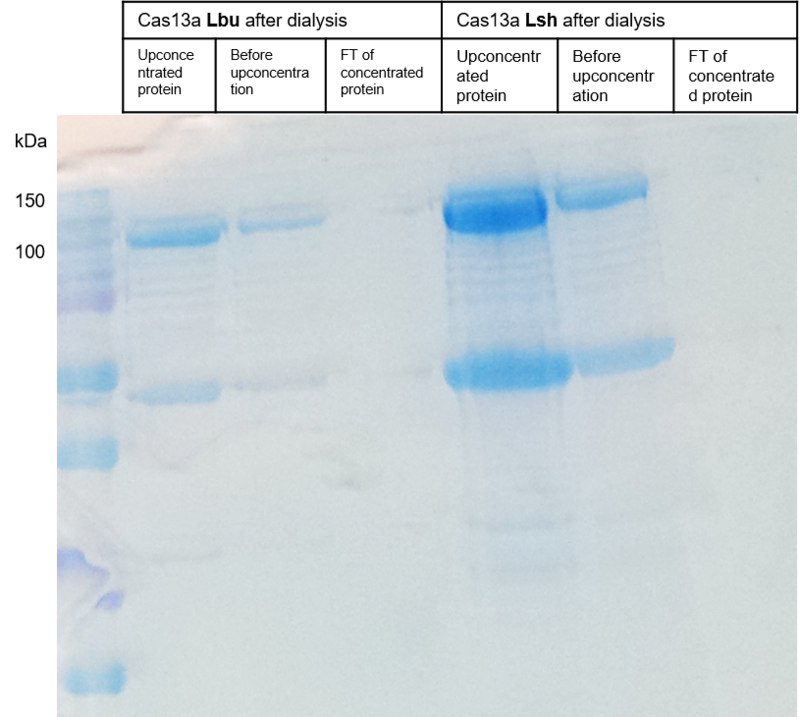 A 1.5% agarose gel was run in TAE-buffer at 110 V for 80 min to check for PCR-products. 1N-3N: 1:1-1:1000 dilutions FINA extraction performed as in protocol, loaded in gel after elution (no PCR). 1G-3G: 1:1-1:1000 dilutions FINA extraction performed with lysis buffer as washing step, loaded in gel after elution (no PCR). P1N-P3N: 1:1-1:1000 dilutions FINA extraction performed as in protocol. P1G-P3G: 1:1-1:1000 dilutions FINA extraction with lysis buffer as washing buffer. 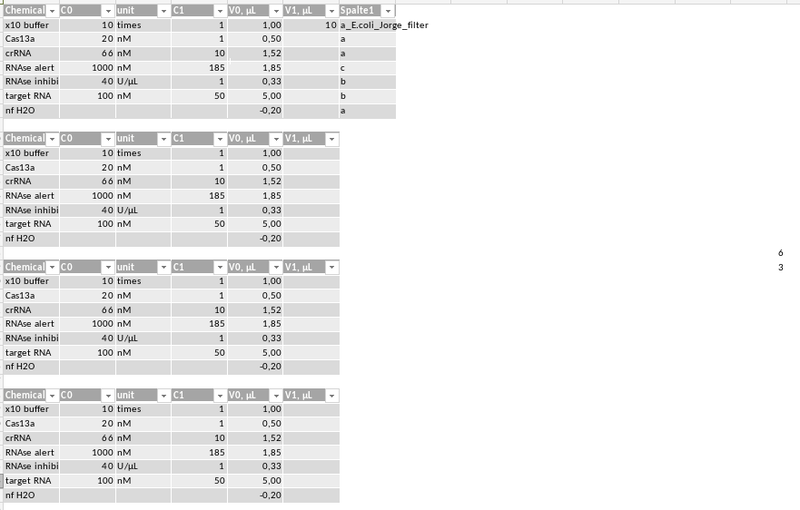 See SDS PAGE of 24.8. to see the SEC result. The extraction was done when the culture had an OD600 of 2.33. The cells were diluted 1:1, 1:100, 1:10000, 1:10e6 and 1:10e8 before the extraction. Each dilution was used as a sample for the FINA extraction. 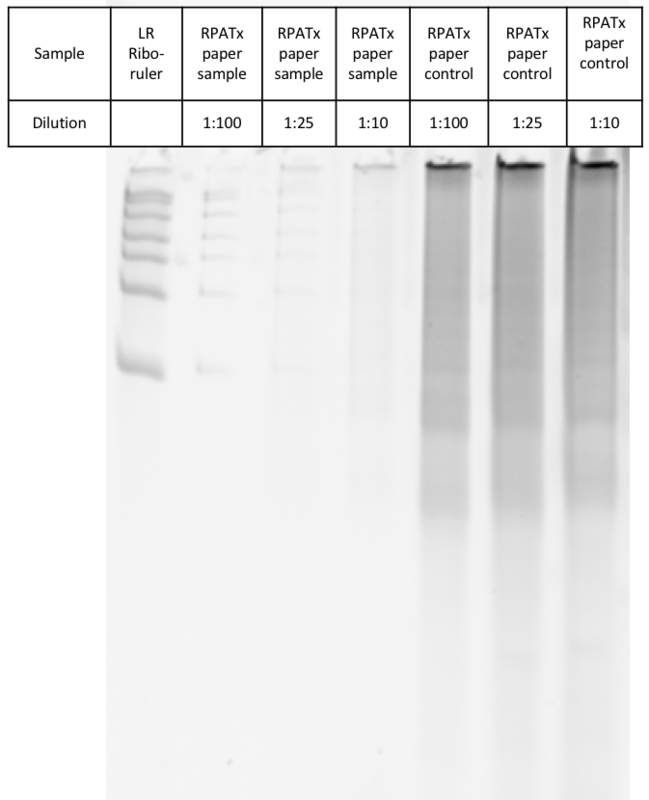 In addition, three 1:1 dilutions were used as samples for FINA extraction: two according to protocol and the third with 300 ul lysis buffer as washing buffer. One of the 1:1 membranes was put in nuclease free water and incubated at RT for 20 min in order for the bounded DNA to go into solution. 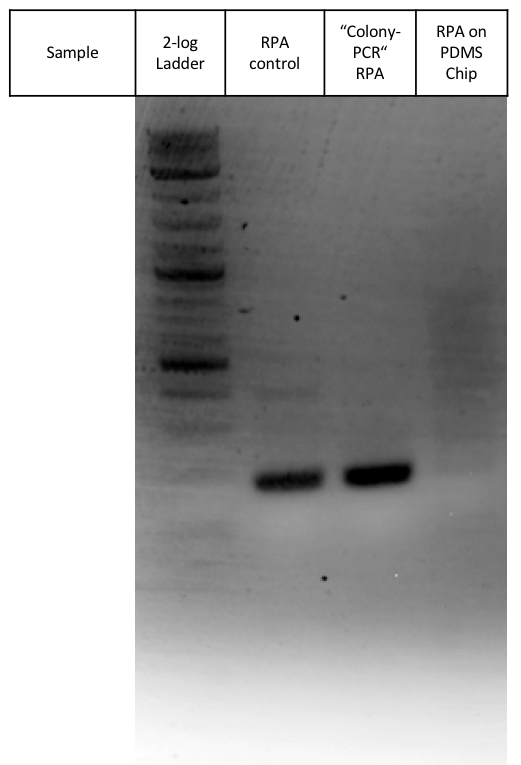 Afte the PCR, only 2,5,L and KK were loaded in the gel, as the other tubes had no liquid. The gel was loaded before it was submerged in TAE-buffer. L: 1:1 dilution FINA extraction performed with 300 ul lysis buffer as washing buffer. 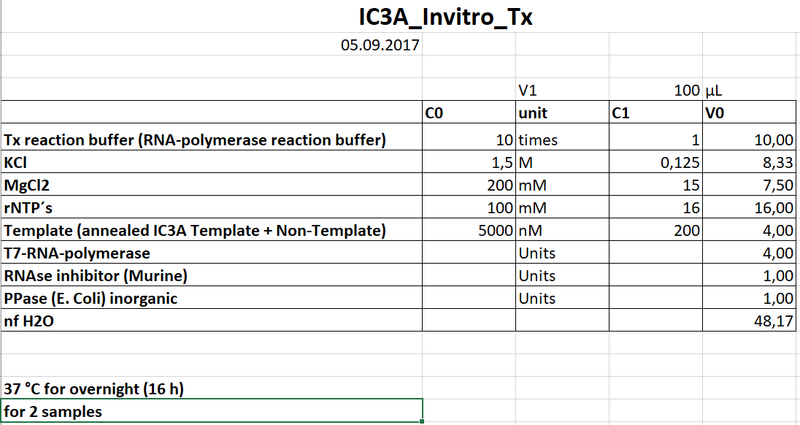 KK: negative control for FINA extraction (LB-medium as sample). 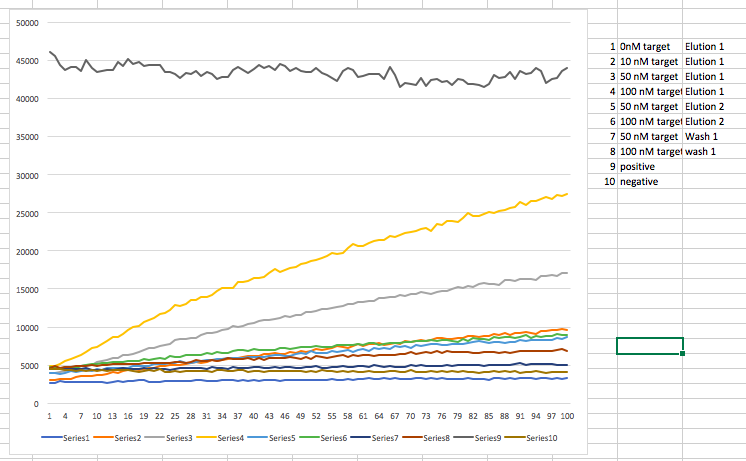 SDS-Gel of SEC-Run from 23.8. 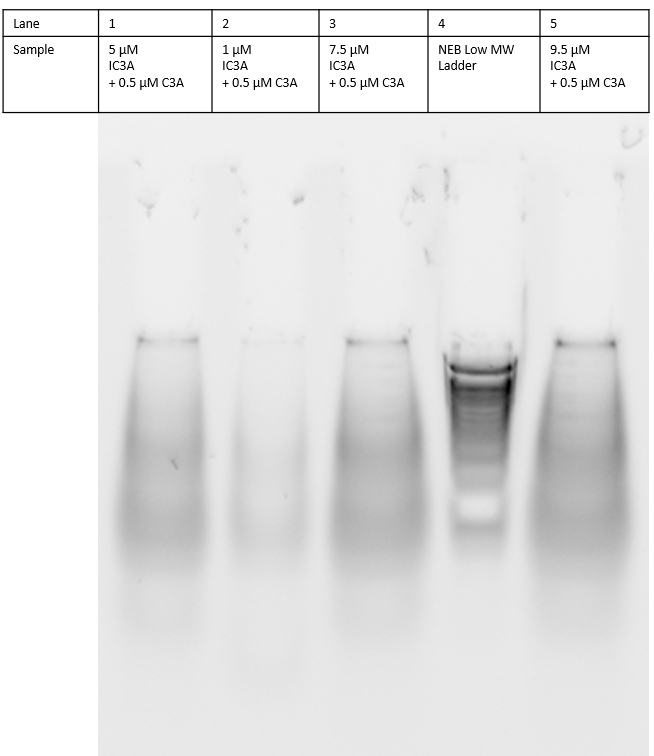 The samples with the highest protein concentration were pooled and used for further experiments. Slight band shift of the oligo between 4 and 5 µM. 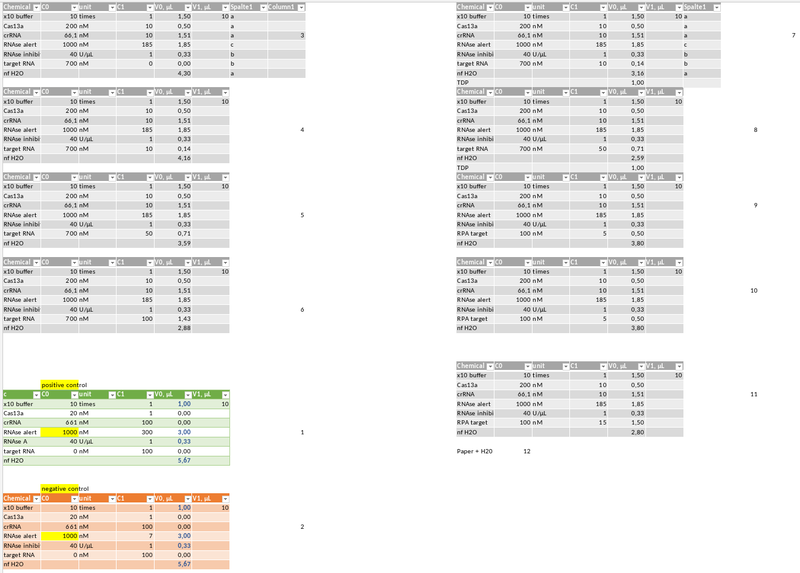 Looks better than 30% PAGE in its resolution of the DNA oligos. As there were problems with the gel from the 23th, we repeated the experiment. The extraction was done when the culture had an OD600 of 2.78. 2 tubes stored at -80 ºC. Labelled gRNA #1, gRNA #2. 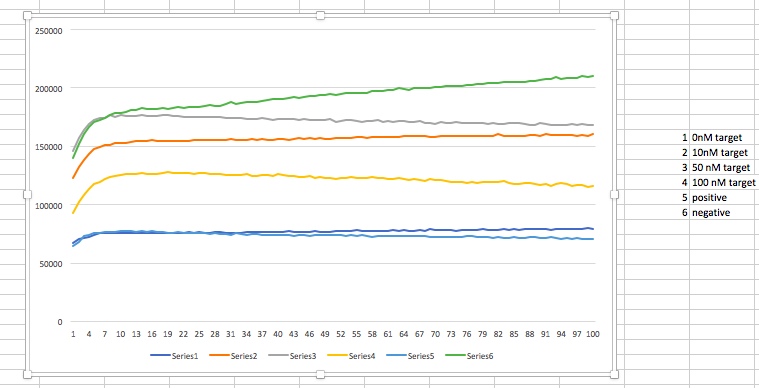 The incubation step at -80 ºC was done, O/N. 2 tubes stored at -80 ºC. Labelled gRNA PEC #1, gRNA PEC #2. The extraction was done when the culture had an OD600 of 0.88. Na: Extraction as in protocol. Cl: Washed with 10 mM HCl instead of NaOH. 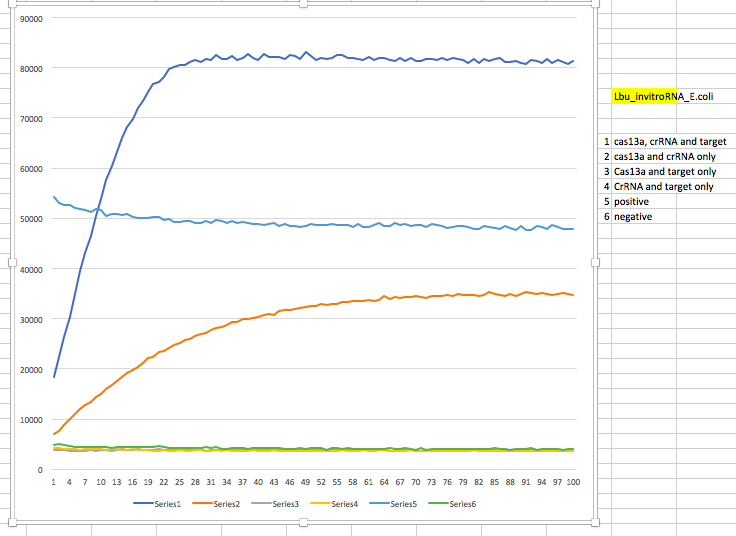 H: incubated 10 min at 80 ºC. L: 10 min incubated in 1 mg/ml lysozyme. LH: 10 min incubated in 1 mg/ml lysozyme at 80 ºC. p-bGal_N_C was used as primer. 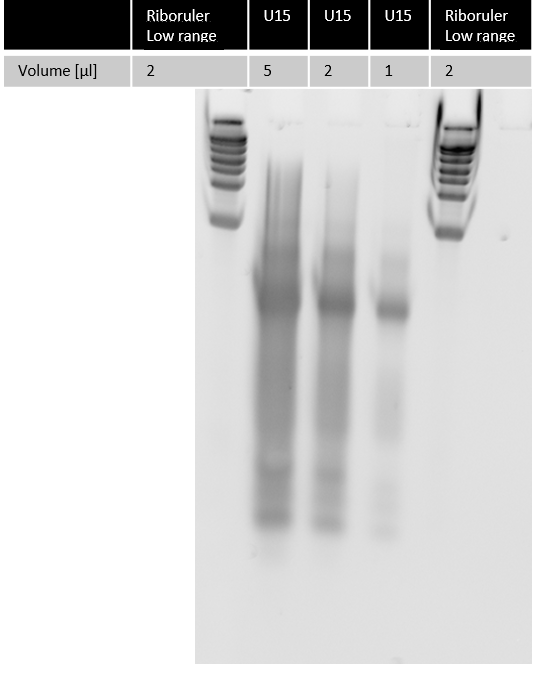 Sample gRNA PEC #1 from 24.08.17 was diluted 1:4 and used as sample P.
The eluate from the FINA extraction for RNA from 29.08.17 was used as sample S.
For both reactions (S and P), 6 ul sample were pipetted. Concentration screen IC3a between 1 and 5 µM. Incubation for dimerization again for 1 hour and at room temperature. 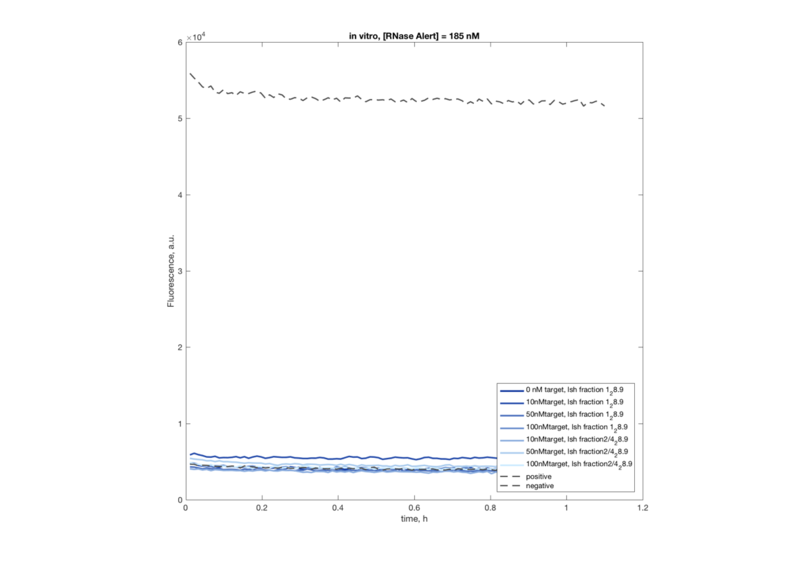 Shift of DNA-oligo band with higher concentration of IC3a RNA until 3.5 µM. 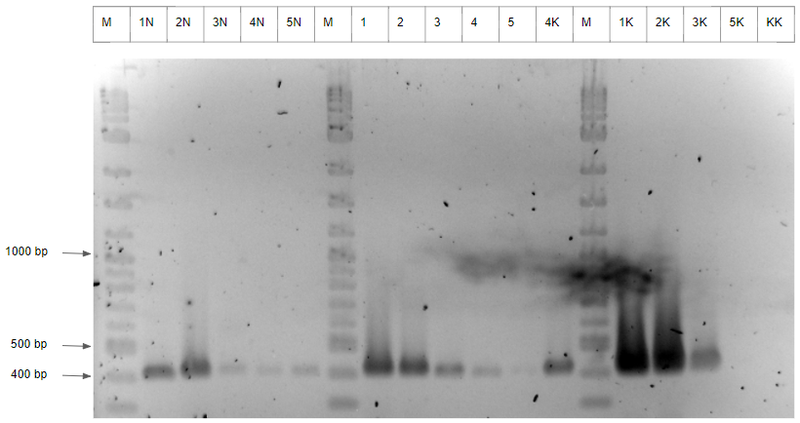 No band of single DNA oligo C3a at 5 µM visible anymore. 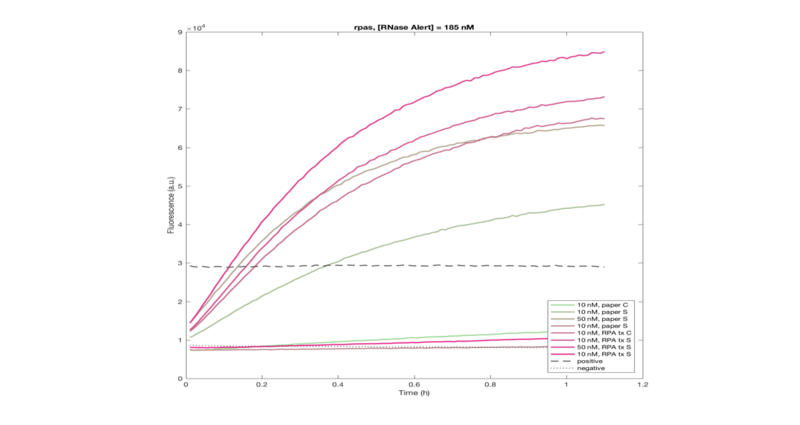 Hypothesis of full dimerization, but with a big background of single stranded IC3a RNA. Na: FINA extraction performed as in protocol. Cl: FINA extraction performed with 10 mM HCl instead of NaOH. K-: negative control FINA (LB-medium used as sample). 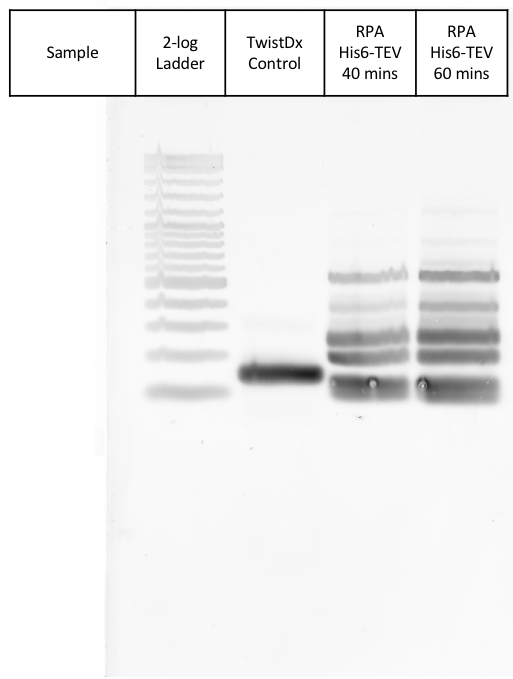 P: 1:4 dilution of gRNA PEC #1 after reverse transcription. 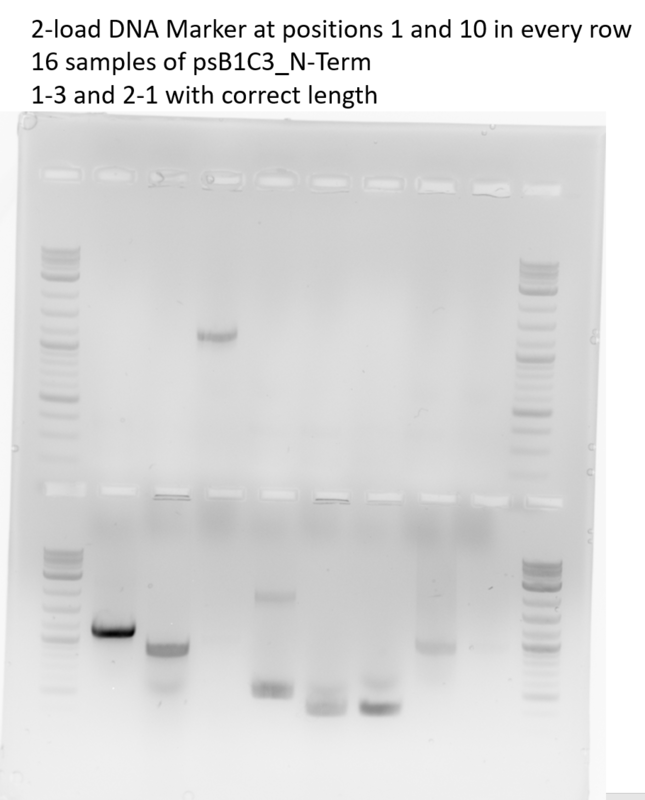 S: 1:4 dilution of gRNA PEC #1 after FINA extraction for RNA and reverse transcription. E. comp transformation of E. coli Turbo with 1 µl of overnight ligation of 27.8. Platted on Cm plates overnight. Plates showed no colonies, as there wasn't enough backbone used. 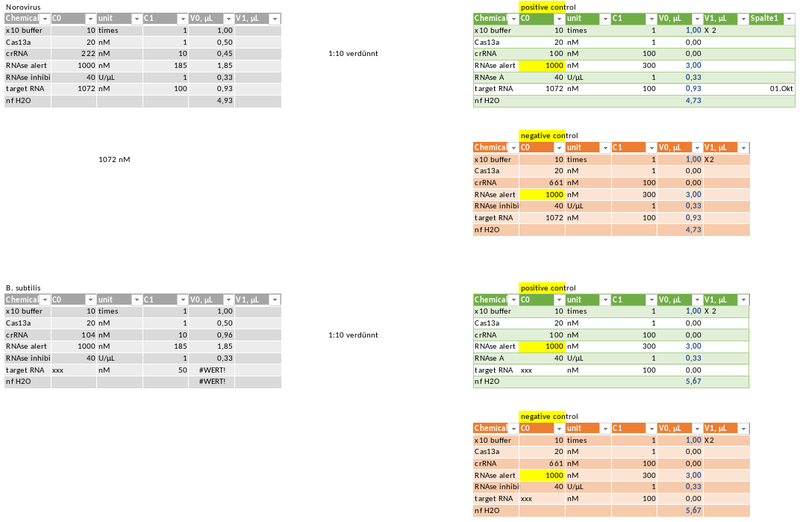 Repeated digestion and Ligation from Thursday 31.8 and ligated 1 C-Terminal and 3 N-Terminal fragments respectively. Did NOT wash silica particles before with binding buffer (pH) and NOT during procedure with ethanol. Acetate-buffer results acceptable now, GuSCN-buffer still a problem.GuSCN probably too difficult clean up, needs too many washing steps. Plates showed no colonies as there was no SOC step. 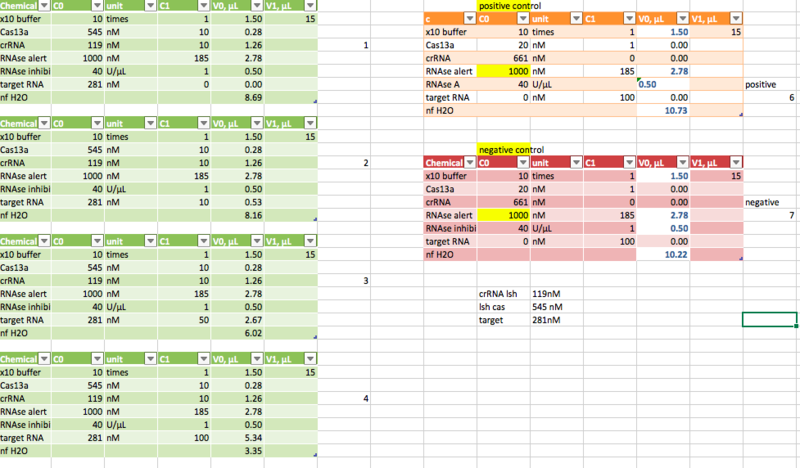 Retransformation of Ligation from Friday into E.Coli Turbo e. comp. Stored at -80 ºC as TRNA PC #1-4. 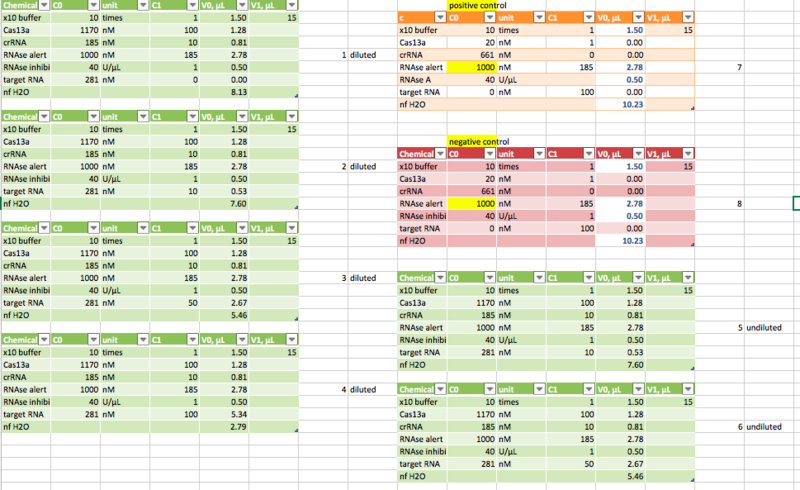 See results Urea-SDS-PAGE from 05.09.17. Terrible yield, need buffer-silica incubation in protocol. 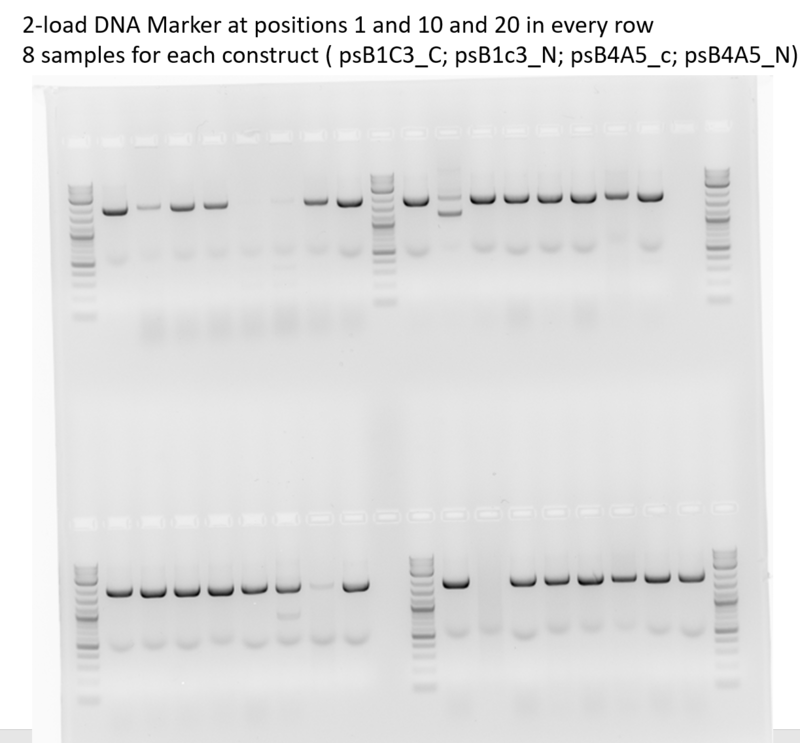 DNA Amplification with RPA was tested using the provided Control Reaction by TwistDx and our BioBrick His6-TEV plasmid incubation times of 40 minutes for Control and Sample 1 and 60 minutes for sample 2. Differences due to incubation time was tested. 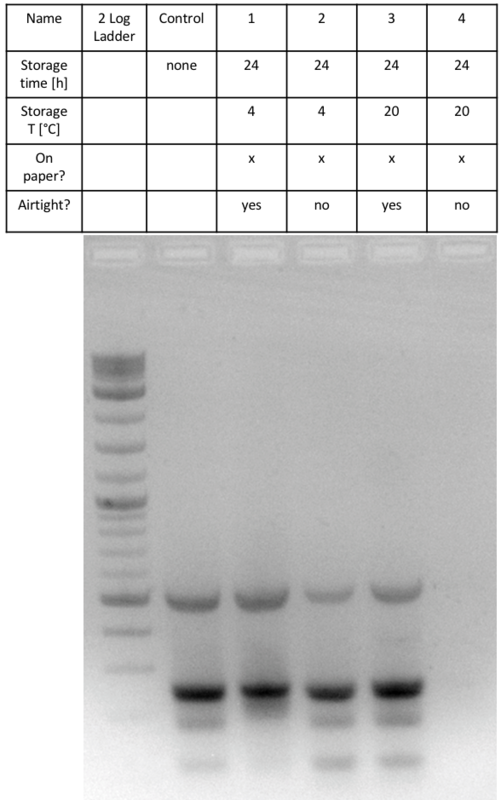 PCR cleanup according to protocol. 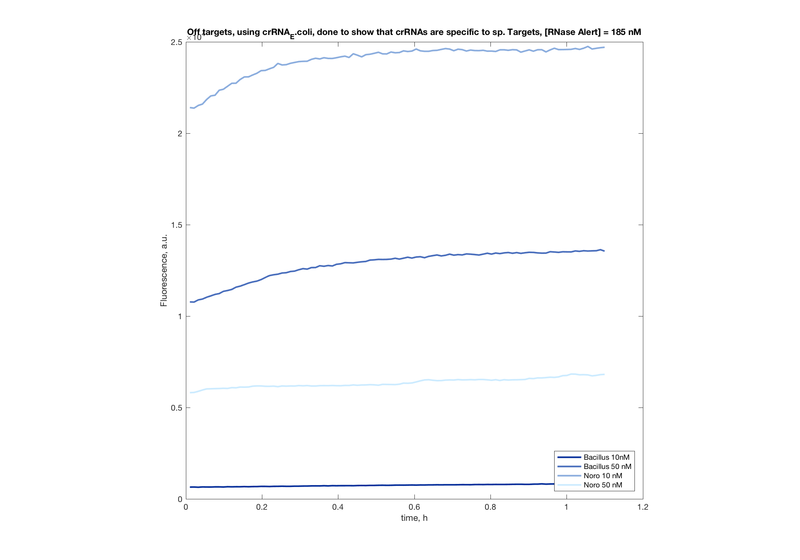 RPA of TEV could not produce the whole (~1300 bp) construct but would produce amplicons of shorter size (100-500 bp) which was anticipated since TwistDx protocol says optimal amplicon length is 500 bp. Full length double-stranded DNA could consequently not be formed. No colonies on plates, therefore usefull competent cells. Positive Control worked. RPA of TEV could not produce the whole (~1300 bp) construct but would produce amplicons of shorter size (100-500 bp) which was anticipated since TwistDx protocol says optimal amplicon length is 500 bp. Full length double-stranded DNA could consequently not be formed. Transformation into chem and e. competent E.coli Turbo and DH5 alpha cells. No colonies in the evening, therefore the plates were left at room temperature overnight. Incubation for dimerization at room temperature for 1 h. Afterwards 1 hour digestion with Cas13a. No real difference visible after digestion for 1 h.
-> Heat-only lysis is too inefficient for that low cell counts, use 109 next time. 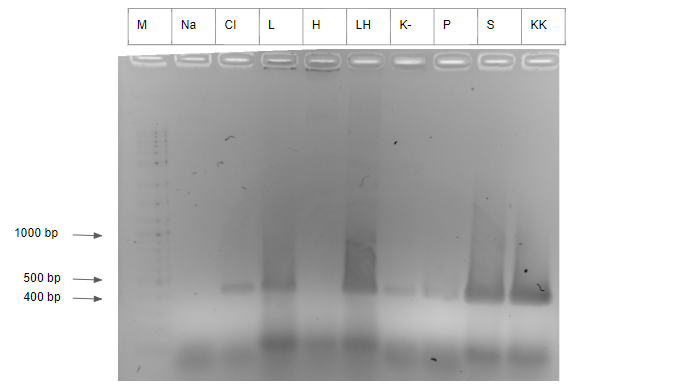 Precultures of 16 colonies from plates of 06.09.17.
psB4A5_C-Terminal 1-7 and 3-4 were positive. 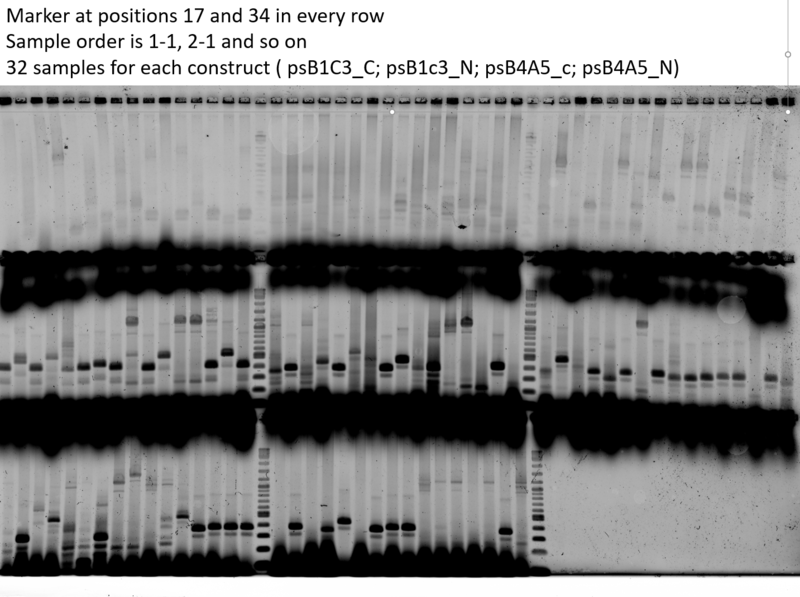 PsB4A5_C terminal 1-7 was sequenced completly and used for further cloning steps. 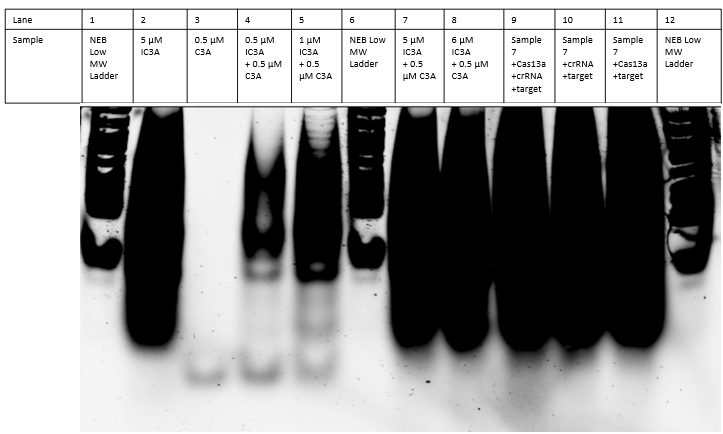 Preparation of stability assay of RPA on paper. Lyophilisation and storage. 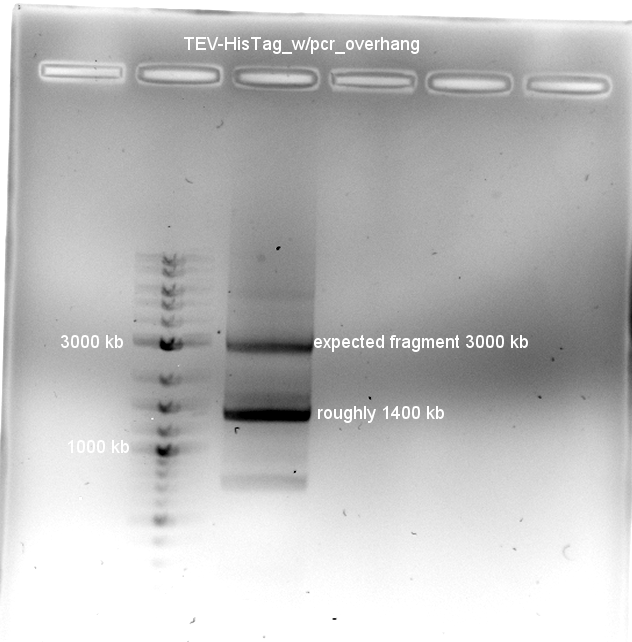 Stability of RPA on paper was tested using His6-TEV plasmid after 0, 2 and 24 hours post-lyophilisation. Reaction temperature was tested at 37 °C as suggested by TwistDx and room temperature. Reaction was positively controlled using non-lyophilised reaction mixture. Lyophilisation of RPA on paper worked. Directly after lyophilisation, the reaction efficiency seems to be similar to fresh RPA reaction mixture. Lyophilisation of RPA on paper worked. 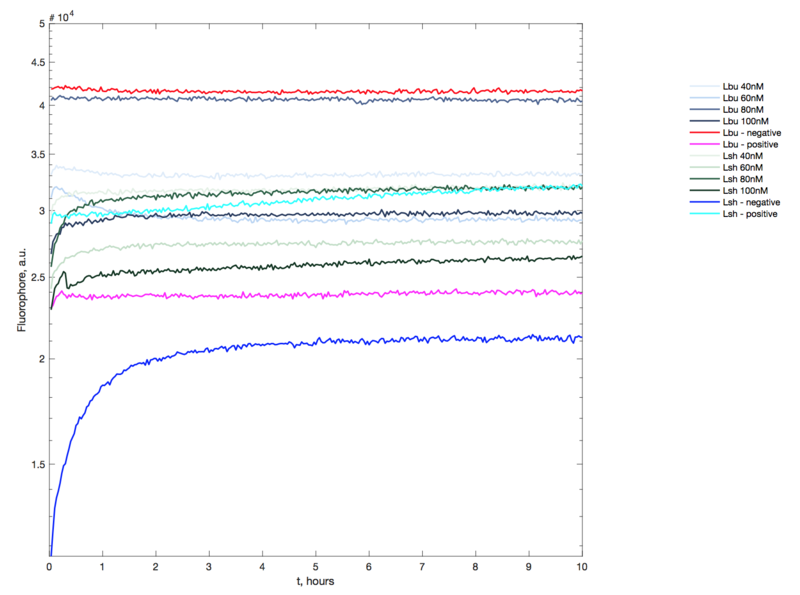 However, activity loss is observed already after 2 hours and after 24 hours, almost no activity is observable anymore. No positive colononies in the Col PCR. 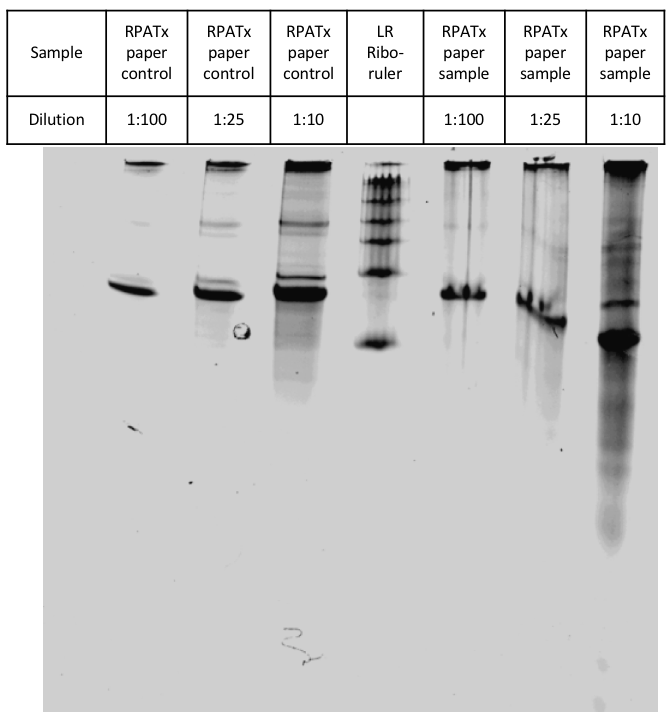 Preparation of temperature and air-sensitivity assay of RPA on paper. RPA on paper according to protocol. Lyophilisation of RPA on paper. Storage with and without Parafilm enclosure at 4 °C or room temperature. Transcription efficiency when coupled to RPA was determined using a reaction without T7 RNA Polymerase as negative control. The construct as template used was His6-TEV plasmid. In-Vitro Transcription could not be shown. 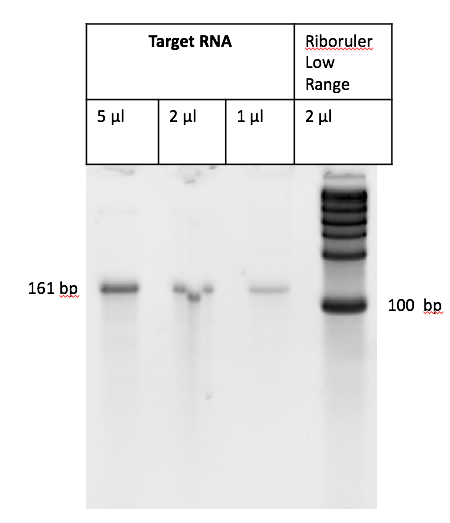 RNA was detected in the samples in which no T7 RNA Polymerase was added while there are no bands in the samples that had T7 RNA Polymerase in them. Though unlikely, a labelling error might have occured. 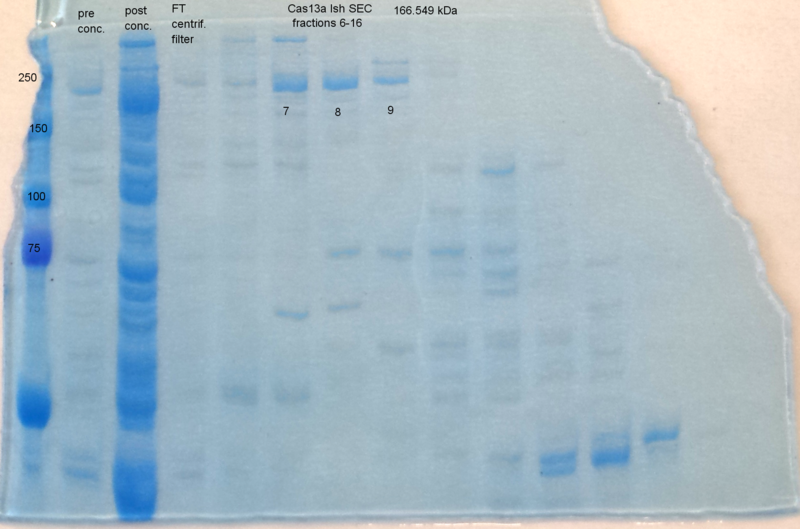 Stability of RPA on paper was tested using His6-TEV plasmid after 24 hours post-lyophilisation. Storage conditions were altered. 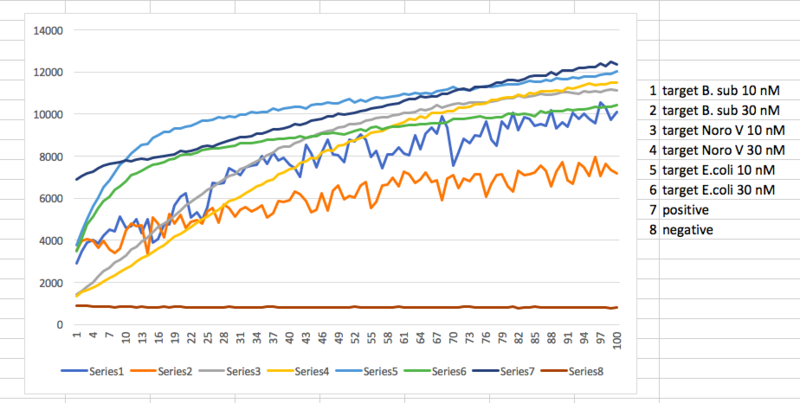 Storage at room temperature and at 4 °C were tested. 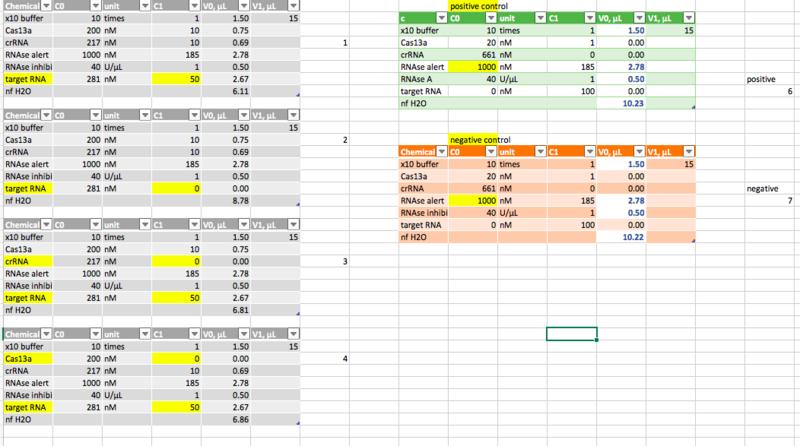 Also, duplicates were done at these temperatures, one sample being always enclosed with Parafilm to avoid air exposure. RPA activity clearly showed that storage temperature did not have a significant effect on the integrity of the RPA reaction mixture. 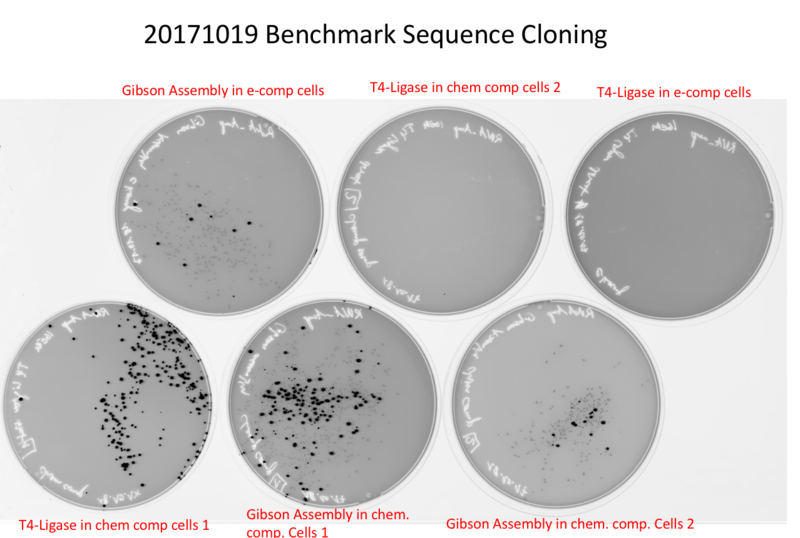 Clean-up from backbone PCR and digest from 18.09.17 followed by	Gibbsonassembly with N-terminal insert. Started the Recloning of the Biobricks by PCR with phosphorylated primers and T4 Ligation and transformed into Turbo chem competent cells. 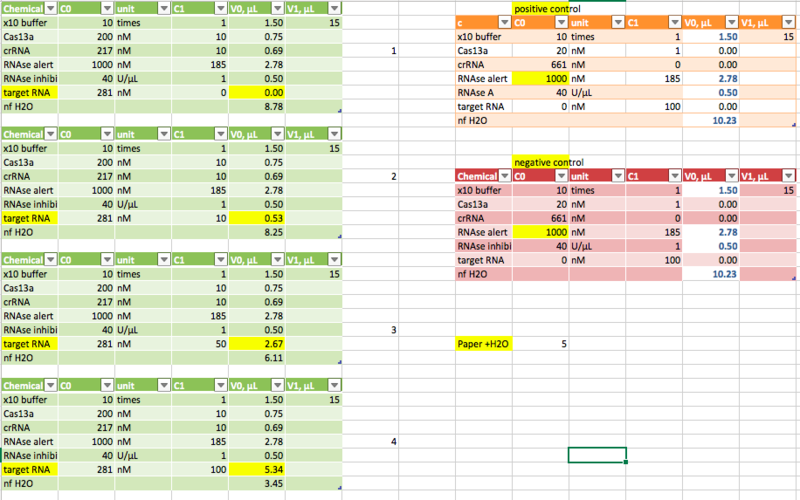 Sample 1-3 and 2-1 had the correct length, and therefore precultures of these colonies were started overnight. 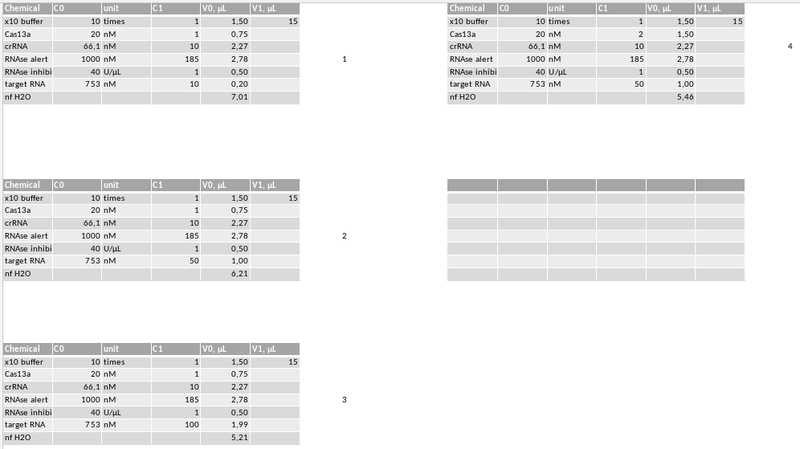 See results of DNaseI digestion and PCE from 20.09.17. Heat differences in this range and this cell concentration have only minor effect. Best lysis seems to be around 80 °C, which is consistens with literature. Minipreped overnight cultures from 1-3 and 2-1. Send samples for sequencing with VF and VR. 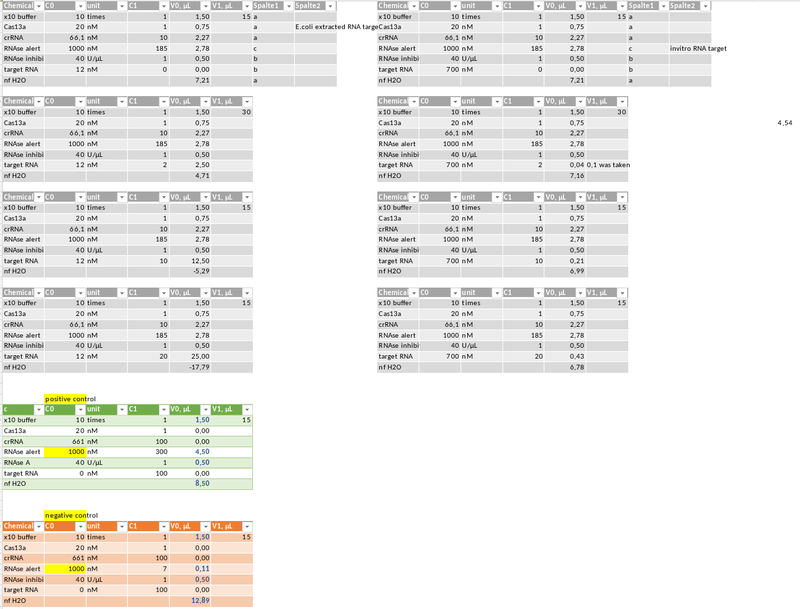 N-Terminal sample 1-3 was positive. 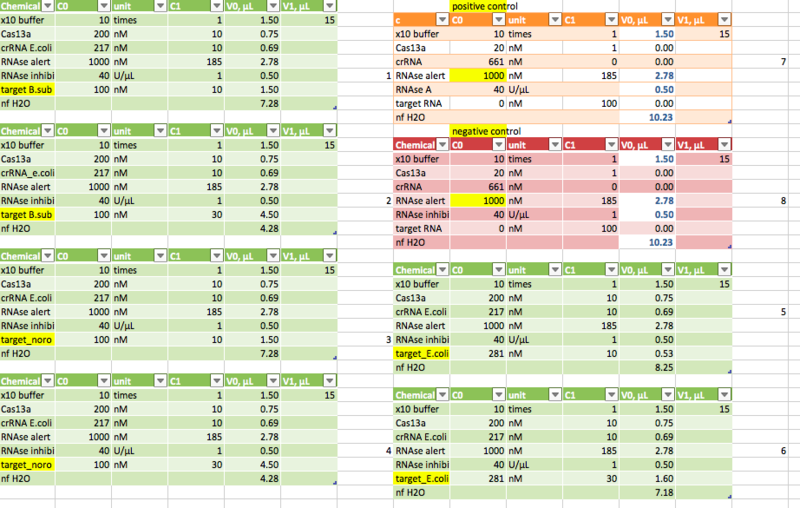 Colony PCR of 36 colonies from each of the 3 constructs His-Sumo-Lwa (Lwa(l)), Lwa(lwa(k) and His-Sumo-Lbu each in psB1C3. 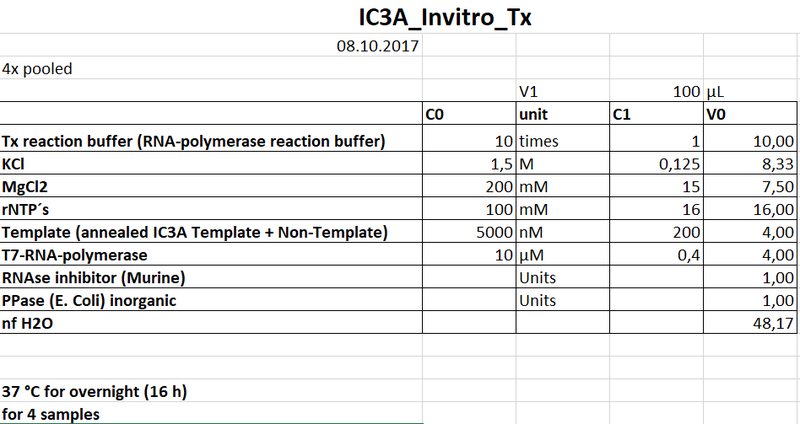 6 M UREA-PAGE of invitro transcribed and pooled IC3a. 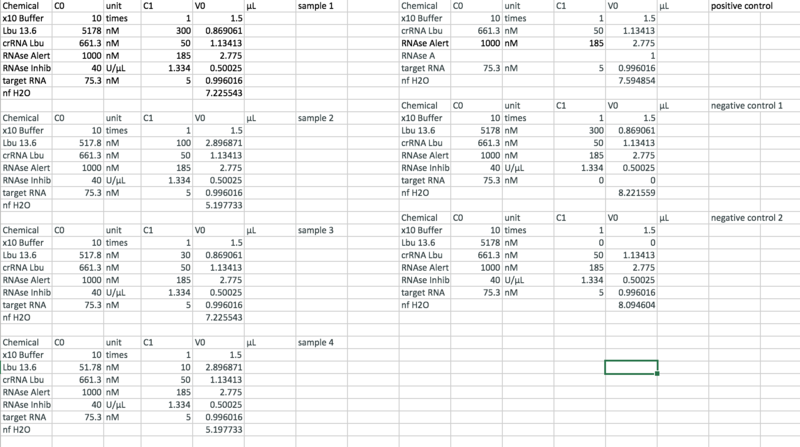 Quantitative gel analysis calculated a concentration of 35 µM. 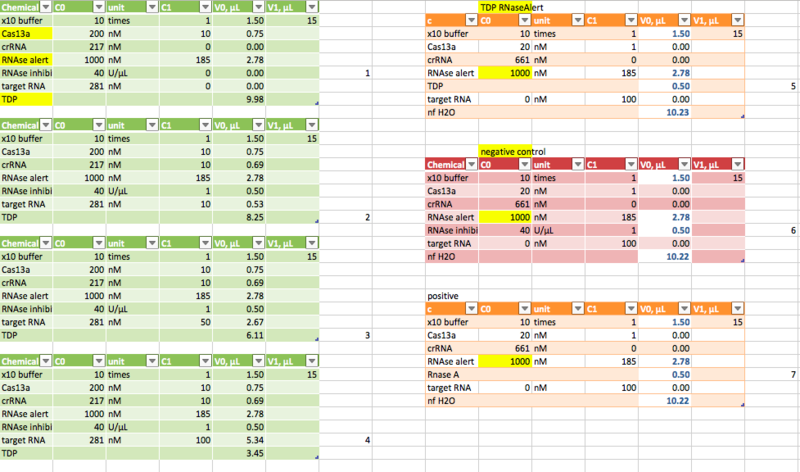 Samples 1-8 and 2-1 of the N-Terminus looked good => preculture for sequencing. Four samples stored at -80 ºC labeled TRNA Lsh #1 27.09.17 and TRNA Lsh #2 27.09.17, TRNA Lsh #3 27.09.17, TRNA Lsh #4 27.09.17. 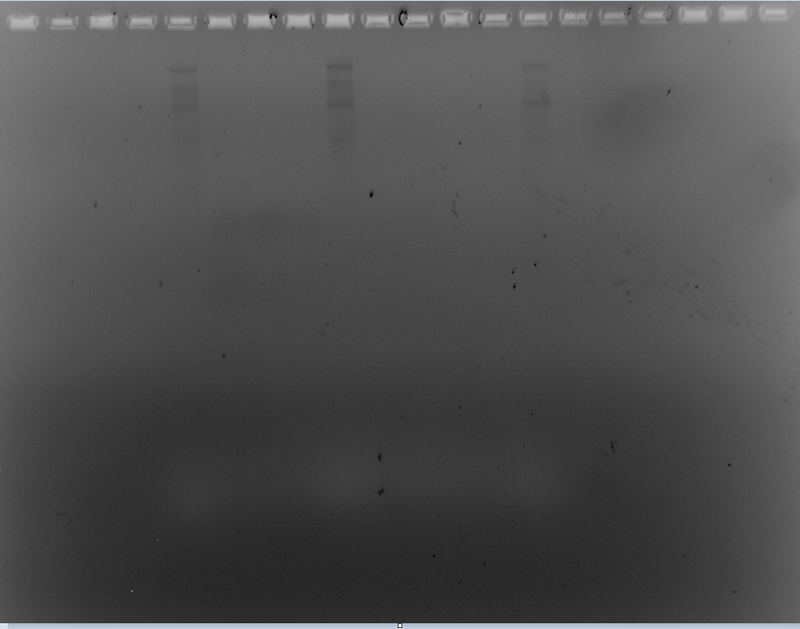 Agarose Gel didn’t work – The samples seems to be degraded in agarose gel , may be due to contamination of the gel chamber and other materials with Rnase. C3a too high concentrated (Red bands). 5 µM instead of 500 nM. 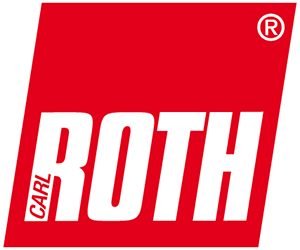 Better results with band shift see 29-09-2017. No visible shift of activator DNA oligo with addition of RNA under the use of Cy5 modified DNA activator oligo. 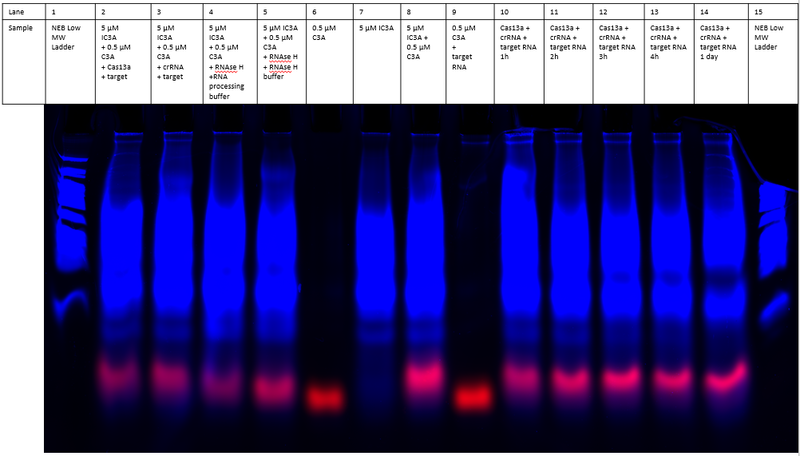 Results are bad because of too high C3A DNA oligo concentration. (C3a = red bands). 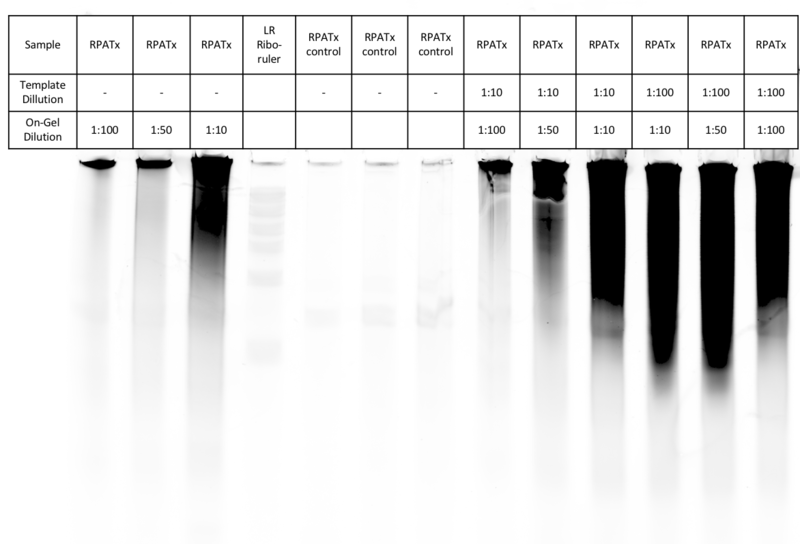 RNaseAlert experiment with extracted RNA targets from E.coli and in vitro transcribed RNAs. 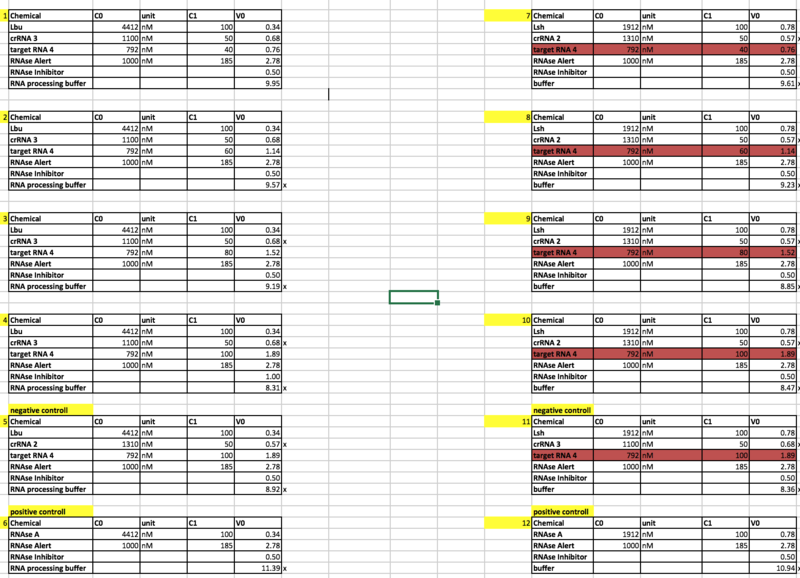 Mini prep of 1-8 and 2-3. 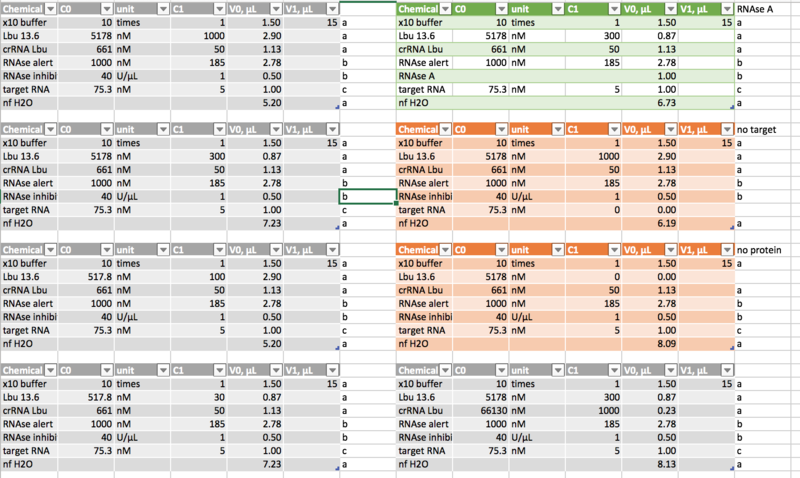 FINA was performed with 25 ul sample instead of 50 ul. The extraction for TRNA #2 was performed as in protocol. pseq-Lsh-06rev was used as primer. 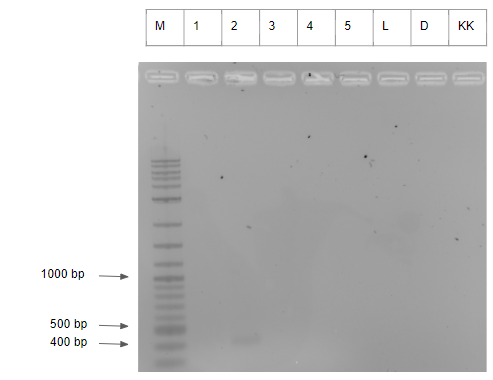 The eluates from the FINA extractions for RNA from 29.09.17 were used as samples. 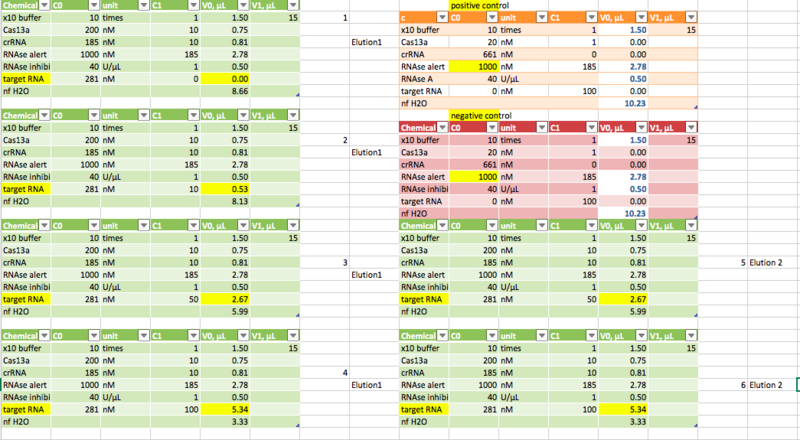 From each pair of samples, one was used as a negative control (nuclease free water instead of MuLV-RT). For all reactions, 6 ul sample were pipetted. pseq-Lsh-05fwd was used as forward primer. pseq-Lsh-06rev was used as reverse primer. Annealing was performed at 58 ºC. 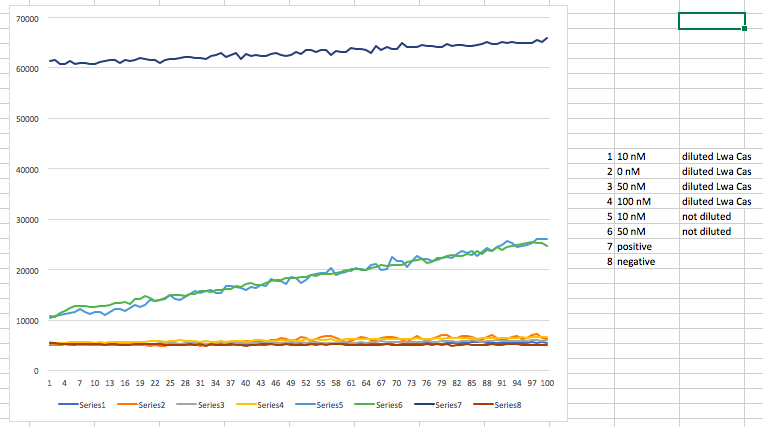 The amplification step was 110 s long. N: FINA extraction performed as in protocol. NK: FINA extraction as in protocol. 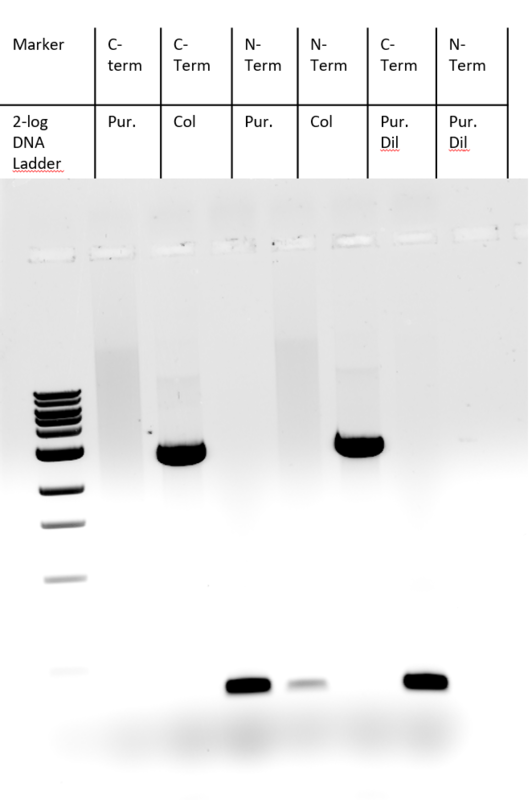 No RT in cDNA synthesis (negative control). P: Digestion of DNA before FINA extraction. PK: Digestion of DNA before FINA extraction. 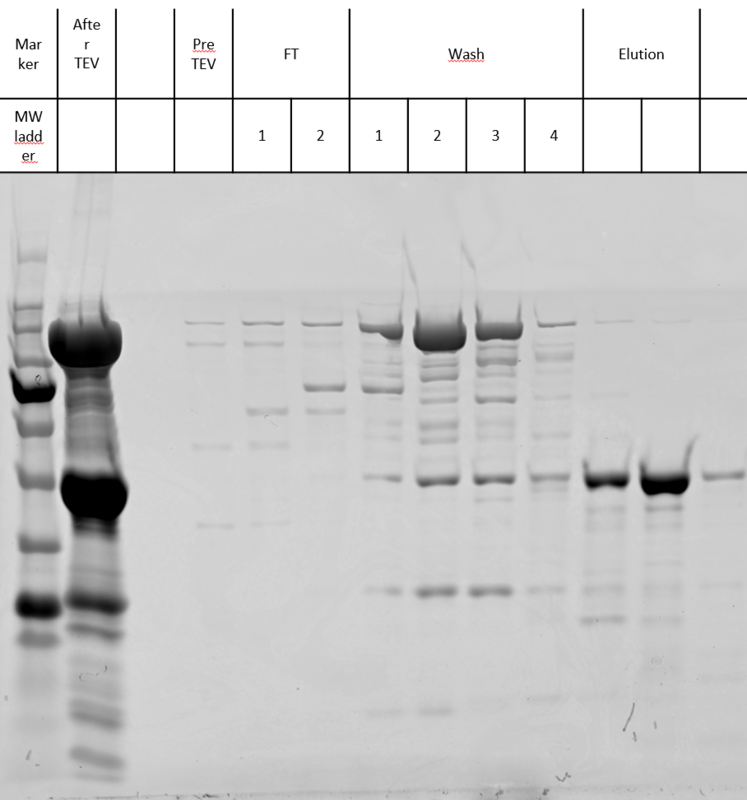 No RT in cDNA synthesis (negative control). A: Digestion of DNA after FINA extraction. 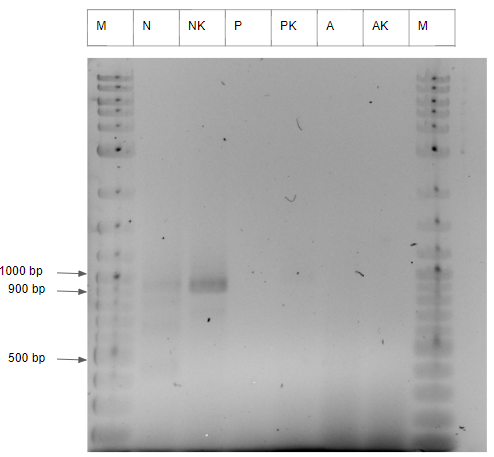 AK: Digestion of DNA after FINA extraction. 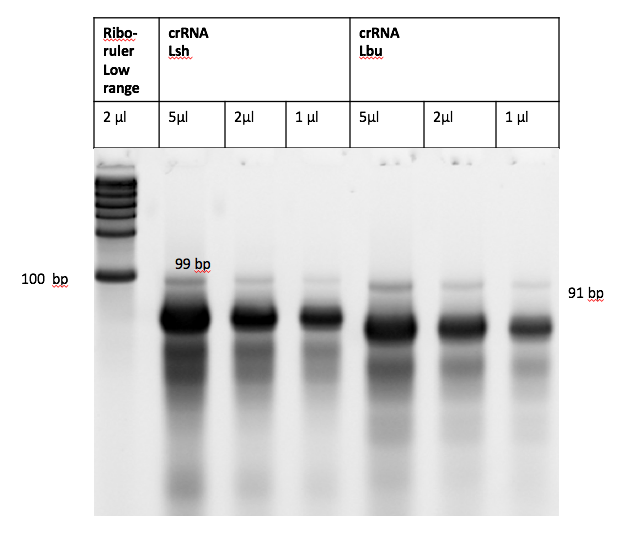 No RT in cDNA synthesis (negative control). 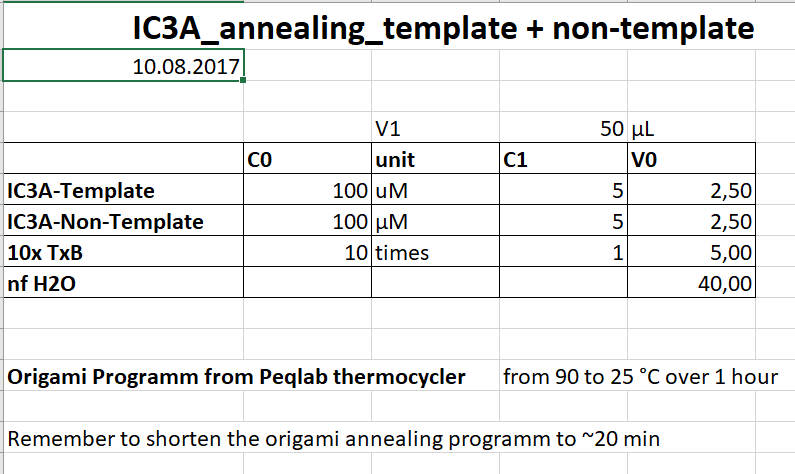 Forgot to add C3ds with single strand overhang, which is needed for activation of invitro transcription after binding of DNA oligo C3a (activator of C3ds). 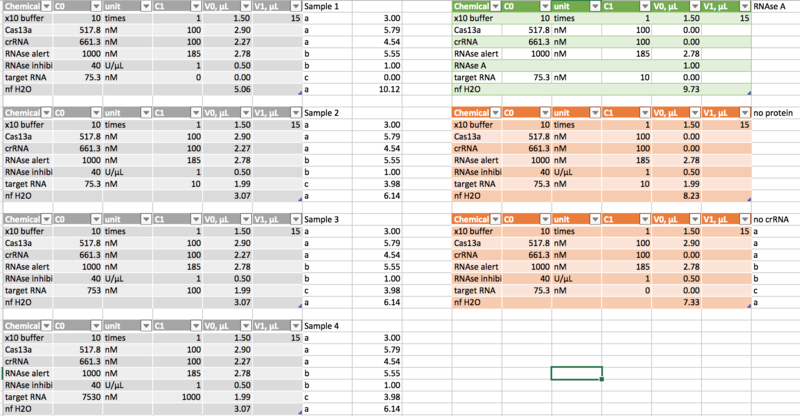 Plate reader data showed no activity for all samples, as expected without DNA template to transcribe. Bacillus, Noro virus and HCV seeem to work. However Q5 beta needs to be repeated and also HCV could be repeated! 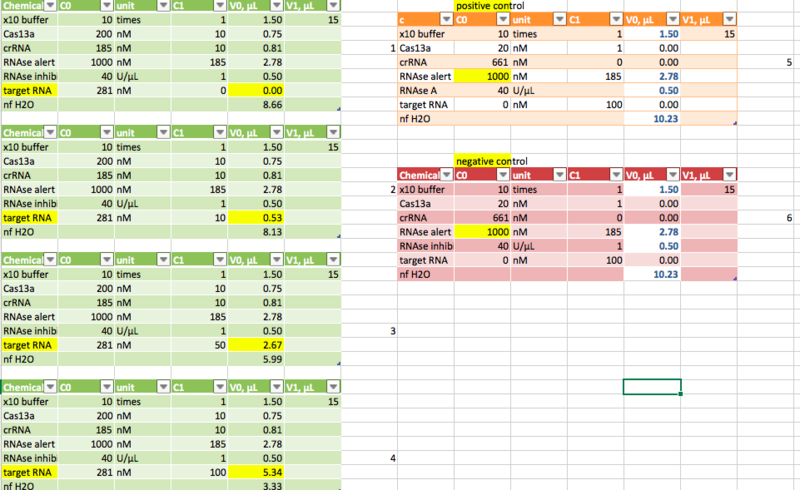 Works, Target-sequence with PCR detected. No Invitro transcription of RNA at any T7-Polymerase concentration. 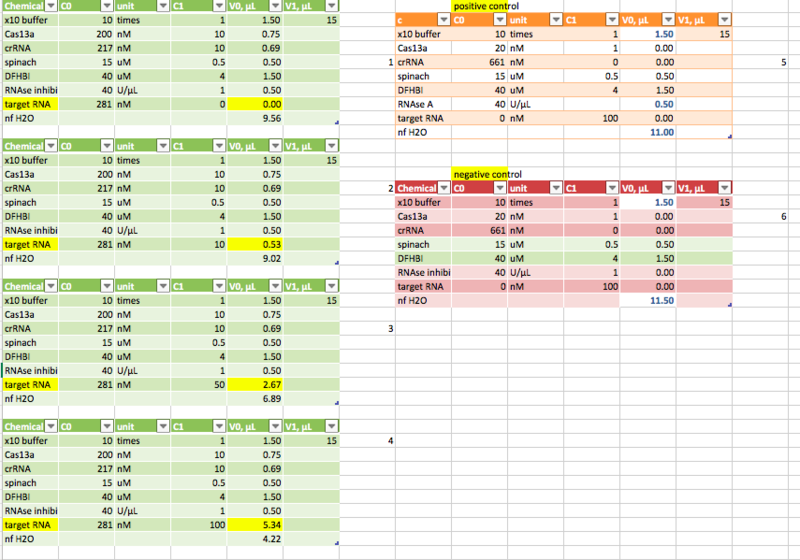 LBU does either not set activator DNA free or does not work at all. Same result as on the gel. 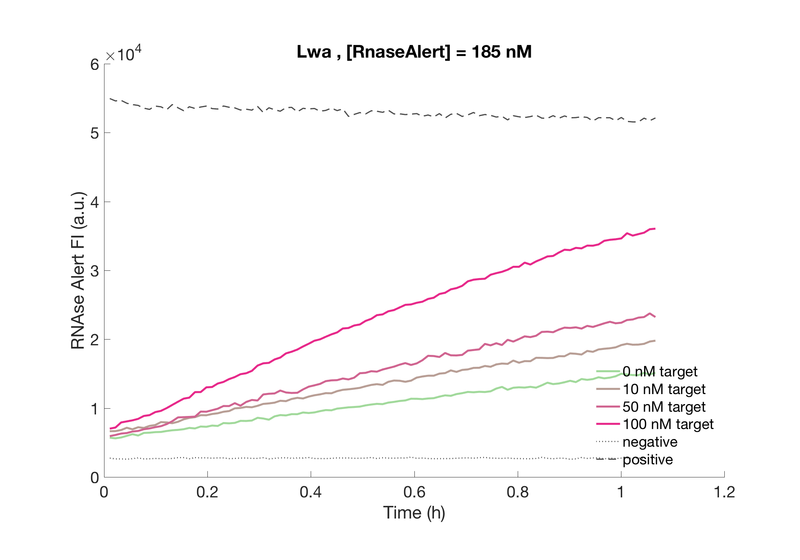 RNAse H shows low level fluorescence over the whole experiment, which can not be related to an invitro transcription. Full read with no mutations. Empty plates => need to repeat PCR. 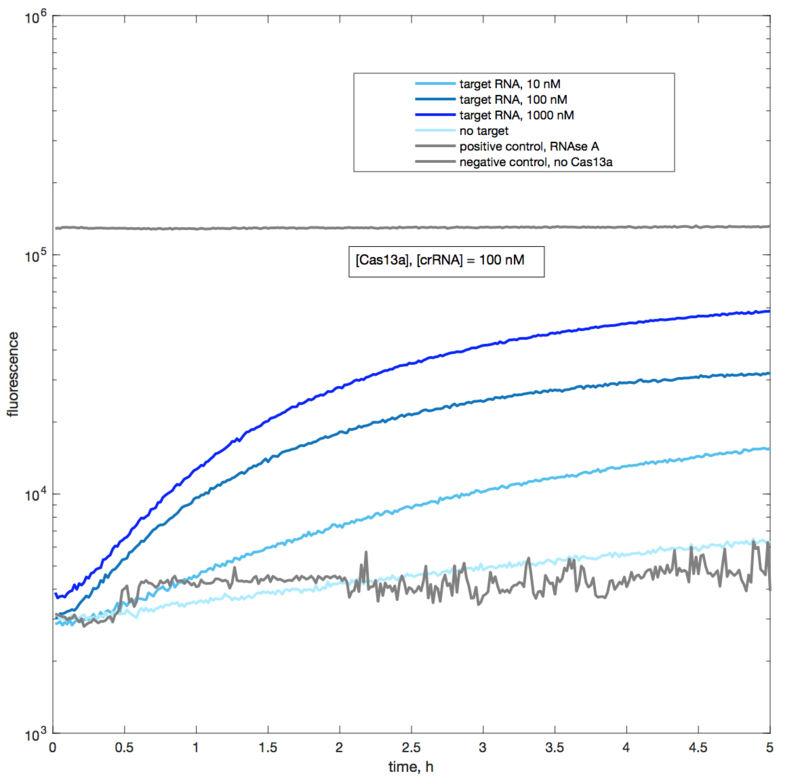 following SIGMA Genosys Protocol from Step 1 to 7. 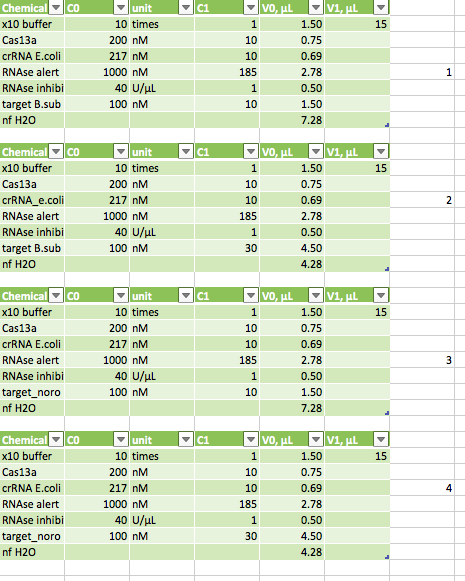 Then, followed Lab´s protocol steps. RNA sample stored at -80°C and needs to be quantified. There was no RNA visible. The in-vitro transcription was repeated. 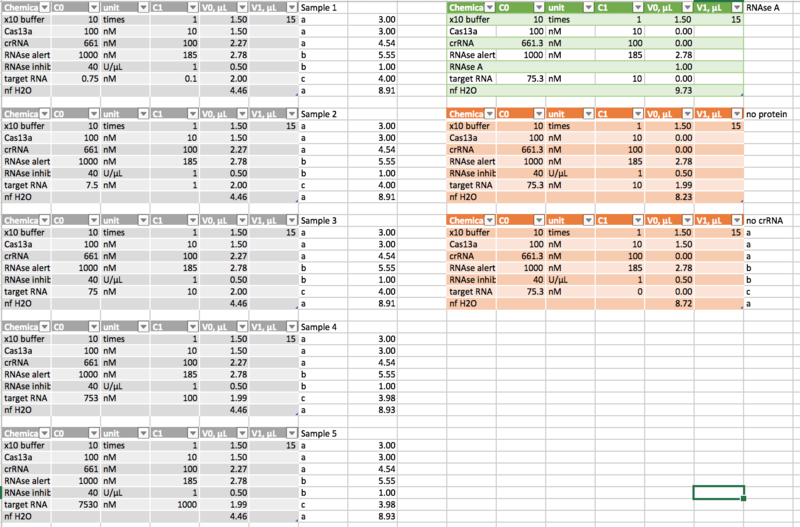 1:10.000 seems to be the right dilution of SybrGreen II dye for a 15 µl Sample. The in-vitro transcription was repeated with a new batch of T7 RNA polymerase. See results of Digestion and PCE from 09.10.17. Higher concentrations of T7-polymerase causes the maximal concentration of RNA to be reached faster. 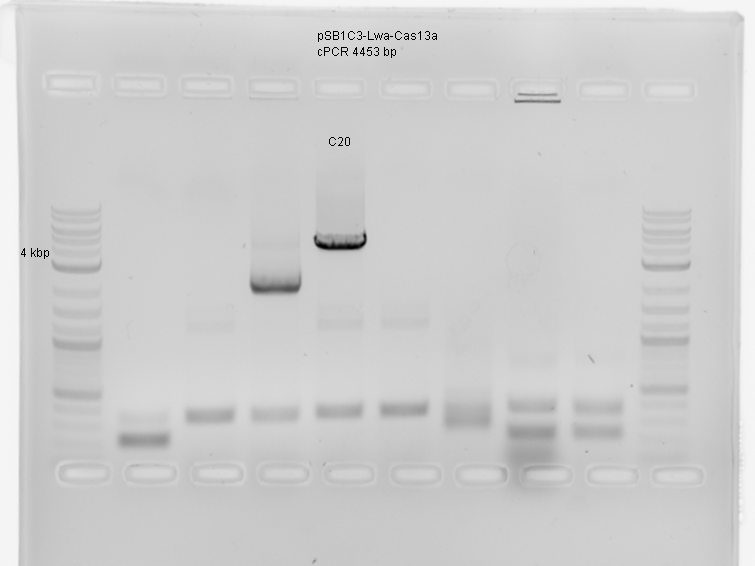 PCR for Gibbson with Biobrick fwd and rev primer. Lbu Gibbson Assembly with 3x excess of insert. 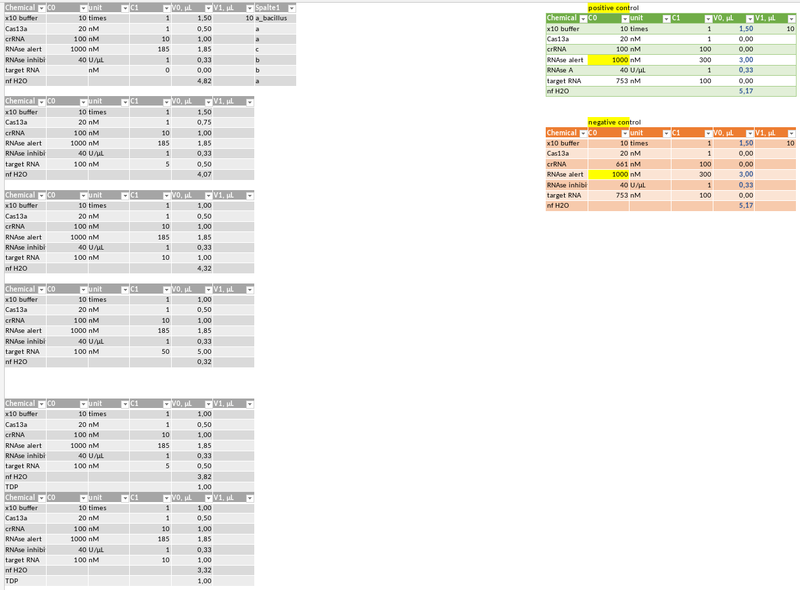 Trafo into E. coli chem and e comp. with the paper strips (glass fiber filter paper) 1.8 ul reaction mix pipetted with different amounts of invitro transcribed RNAs. Transcription efficiency when coupled to RPA was determined using a reaction without T7 RNA Polymerase as negative control. The construct as template used was RNA Amp G-Block 200 bp double-stranded DNA using VF and VR as primers. RPA-Tx and RPA-Tx on Paper according to protocol. 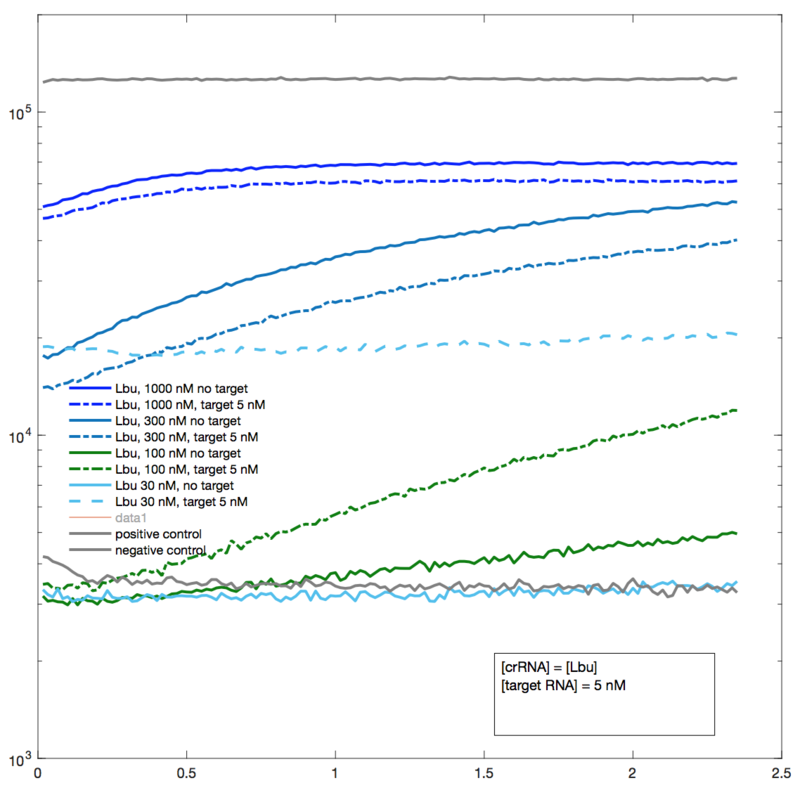 Solubilisation of G-Block to reach 10 ng/ul concentration. 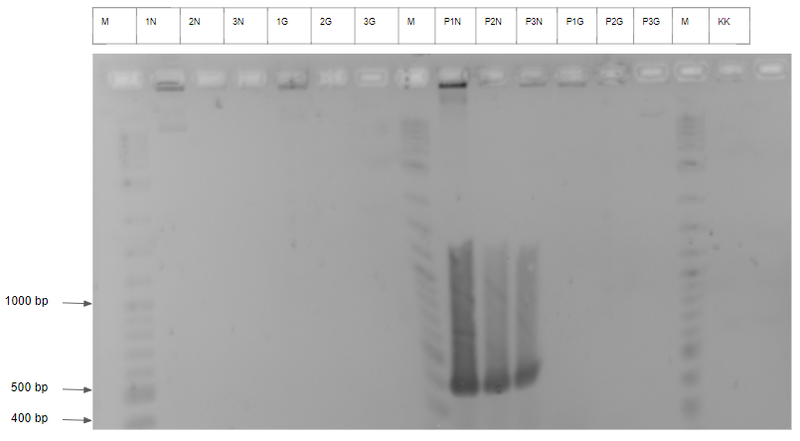 PCR reaction using VF and VR as primers resulted in 50 ul of a 24 ng/ul solution. 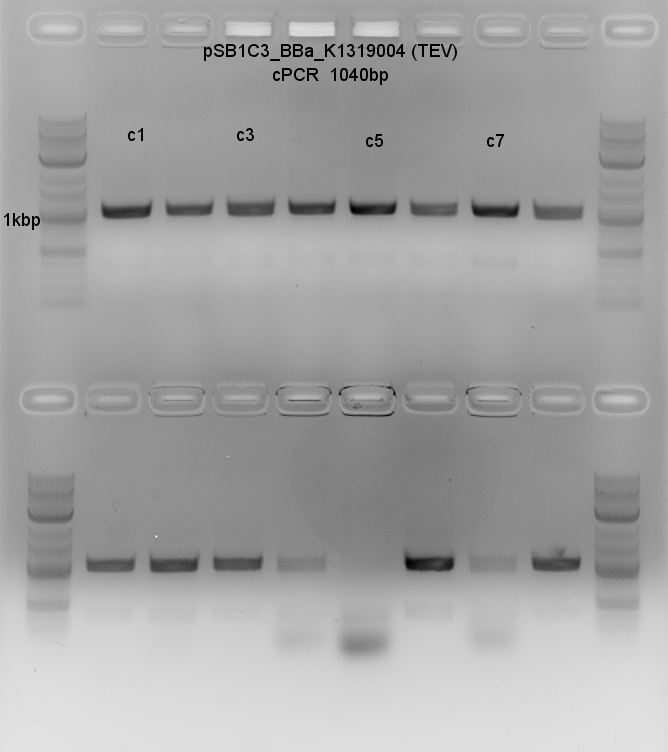 PCR reaction using pSB1A3_fw and pSB1A3_rev for backbone amplification of pSB1C3-GFP yielded 54 ng/ul. 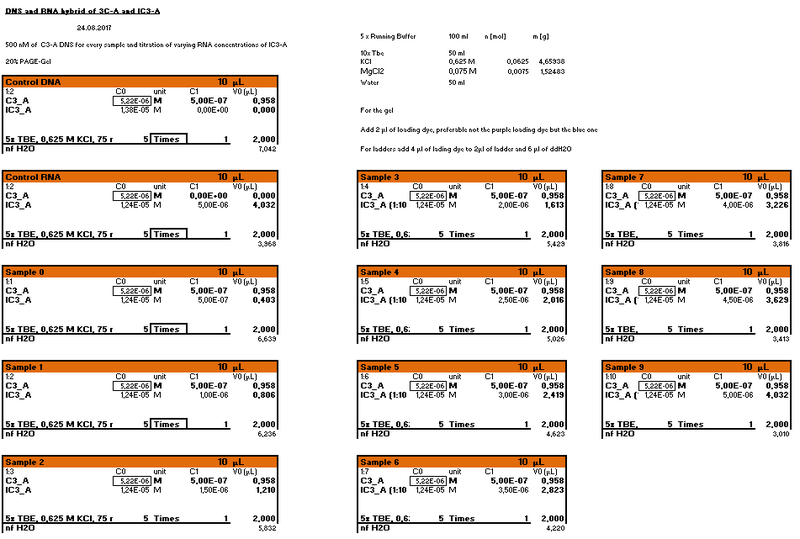 Ratio for Gibson Assembly: 0.375 pmol Insert : 0.125 pmol backbone. Incubation for 15 minutes at 50 °C. Restriction of backbone and insert using EcoRI-HF and SpeI-HF in NEB Cutsmart Buffer and heat inactivation. Subsequent dephosphorylation of backbone using Antartic Phosphatase. 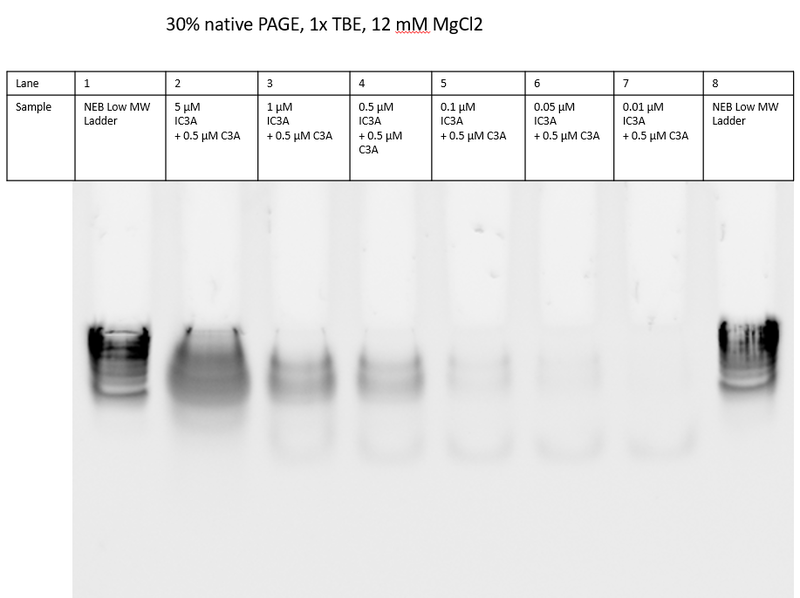 T4 DNA Ligation with a ratio of 0.02 pmol backbone : 0.06 pmol insert. Transformation of Ligation and Gibson Assembly into chemocompetent and electrocompetent Turbo cells. Plate-out on chloramphenicol agar plates. 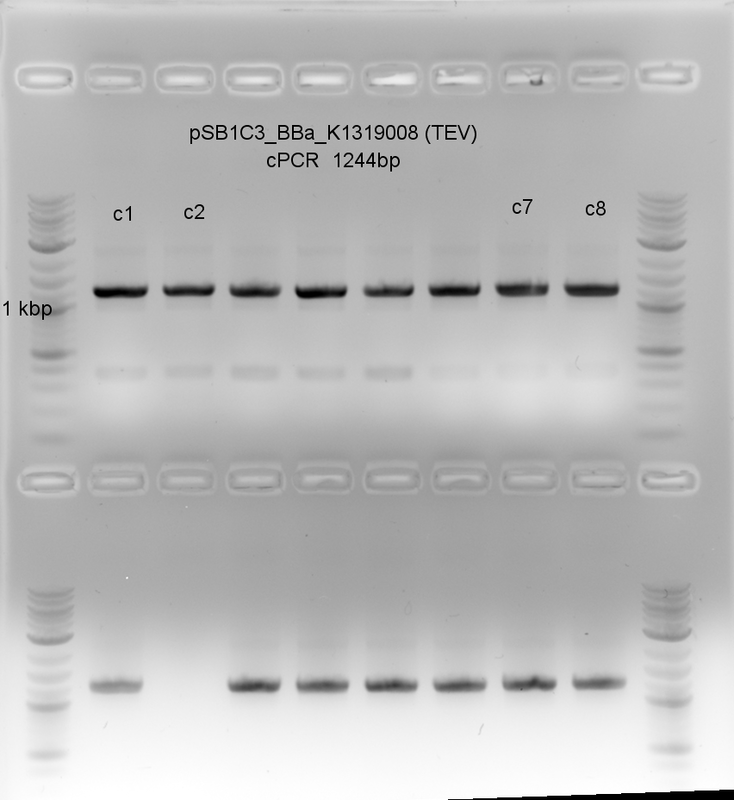 The investigation of the agar plates the next day using UV-light revealed that the only plasmid that was taken up by the Turbo cells was the initial pSB1C3-GFP plasmid. No positive inserts could be identified. Transformation of Turbo cells with Gibbson of 10.10. 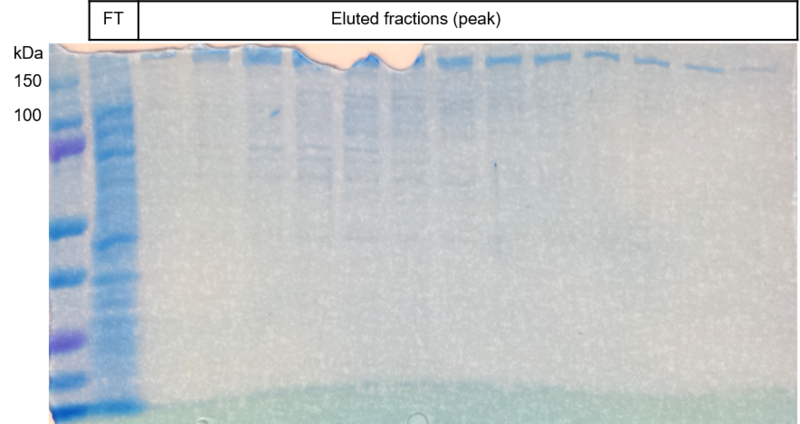 Mistake made: Added T7 Polymerase to Control 2. 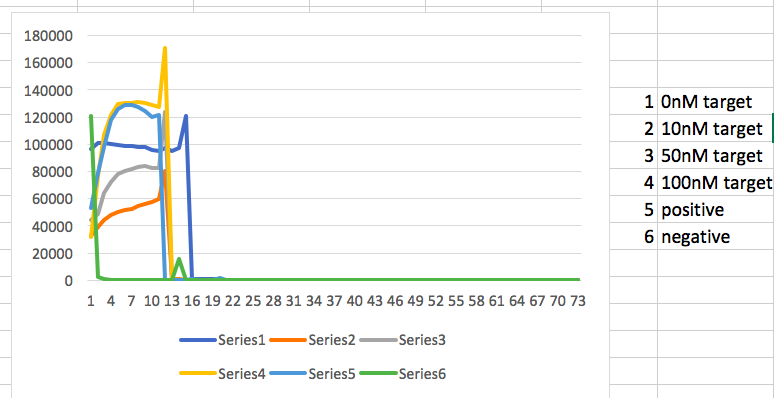 Was left out in Graph. 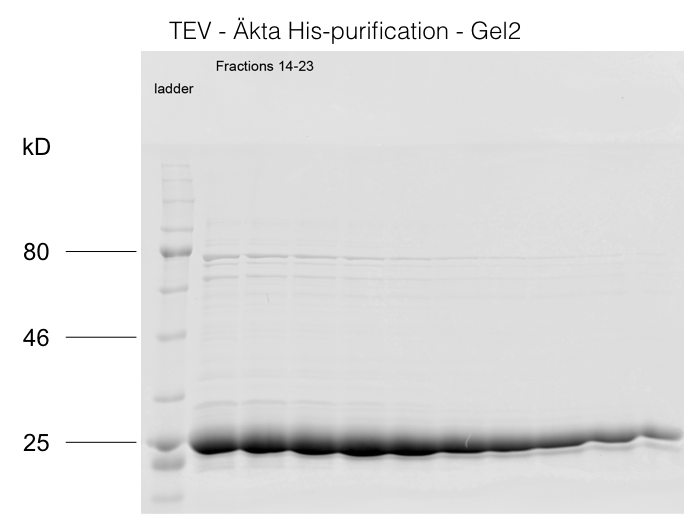 Only Eva Green seems to not influence the invitro transcription, because it was especially designed for live imaging with ongoing transcription reactions. Preparation of AuNP was successfully completed. 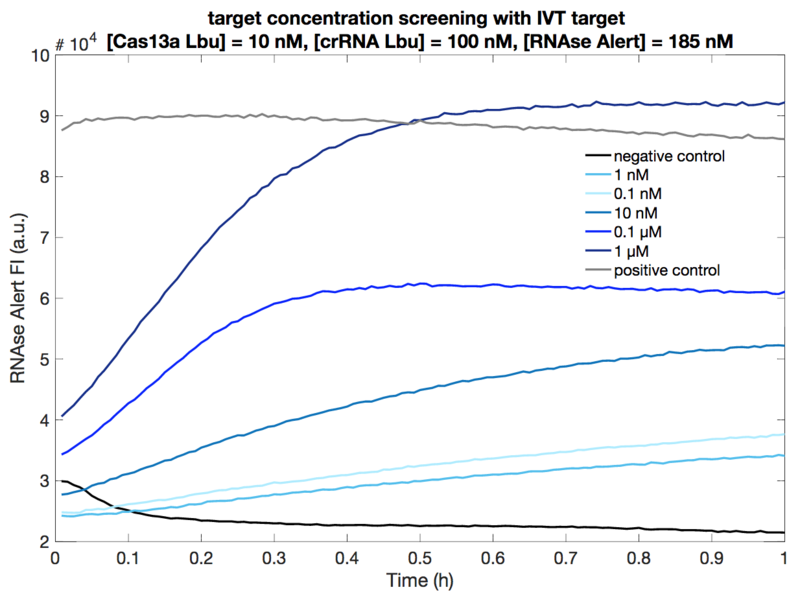 See results from "conjugation test"
1.8 ul of reaction mix pipetted in each paper with different amounts of in vitro target RNA. The overnight blocked paper strips were rinsed with nuclease free water and then dried in the oven at 70 degree for 30 mins and then used for the experiments. Seems to work! Needs to be repeated for the confirmation of results. 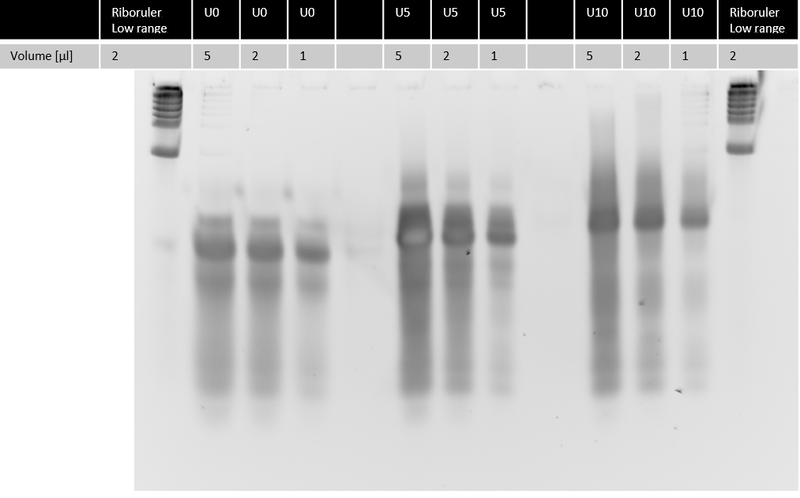 UREA-PAGE Gel of Samples extracted via Phenol-Choloform-Extraction; both according to protocol. 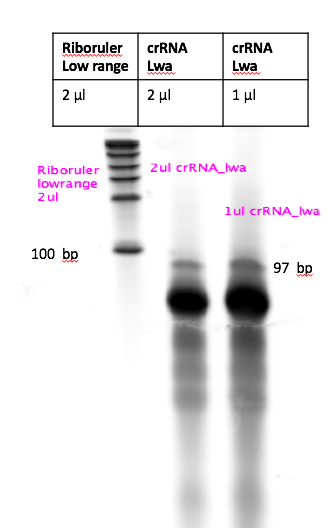 T7 RNA-Polymerase was, by accident, also added to the negative control of the RPA-Tx reaction on Paper. First, one can see that the gel was overloaded. 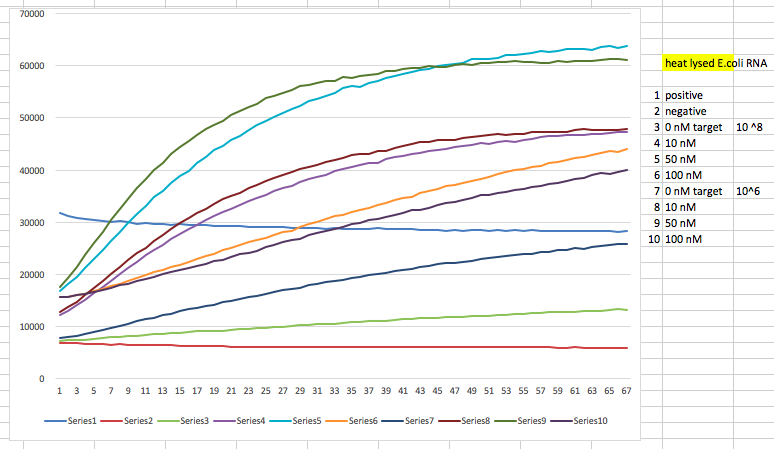 Also, it seems like there is additional bands at the expected size of around 150 bp. Questionable is that this seems also to be the case for the negative Control of the RPA-Tx reaction in Bulk. 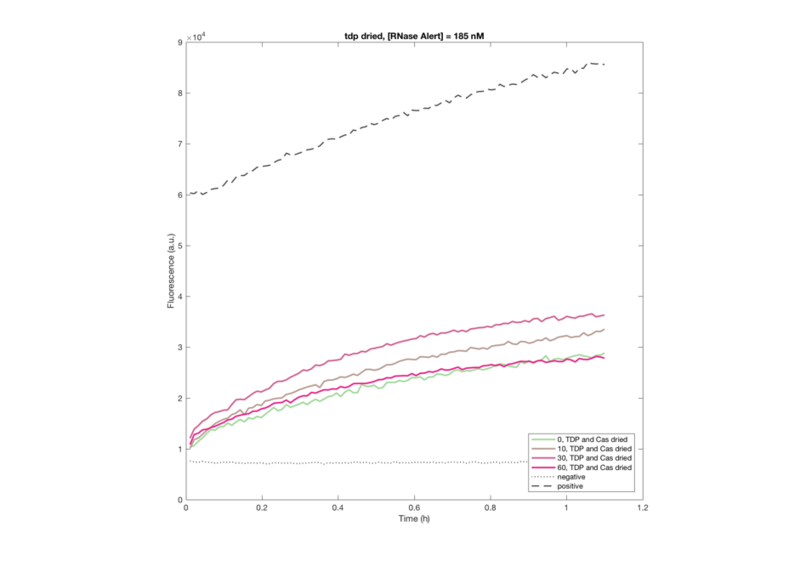 The experiment on paper, however, looks quite promising since it seems like there are distinct bands at the expected approximate size of the RNA transcript. 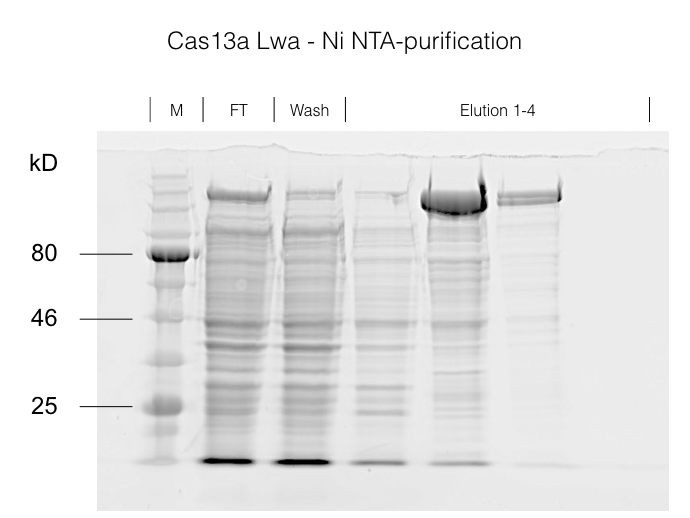 Cas13a cleavage assay will provide evidence if these bands actually consist of the desired target RNA. No colonies for psB4A5 C-Term. 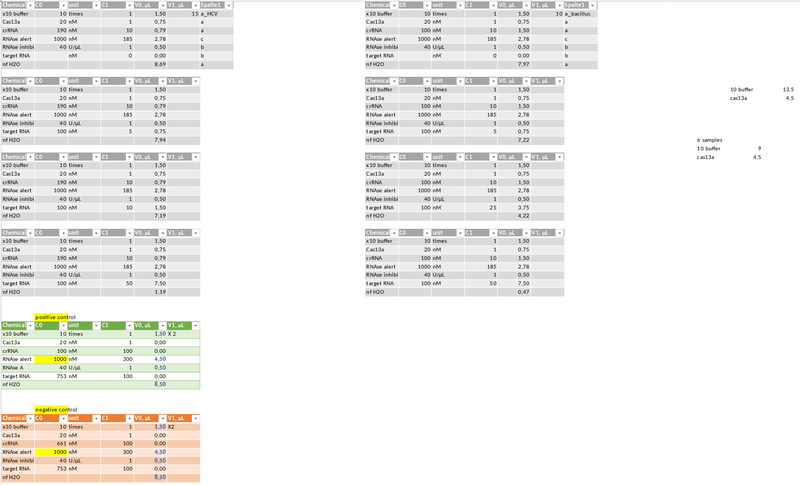 1x Buffer was used first, which resulted in no aggregation. 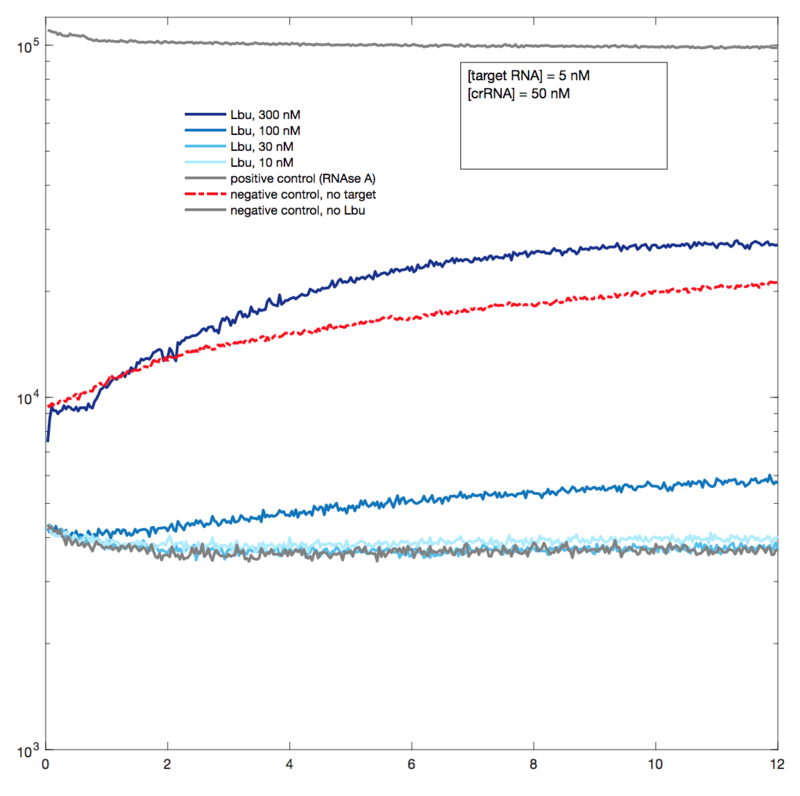 Increasing the concentration by adding buffer to a final concentration of 2x afterwards resulted in aggregation and thus was set as the standard. 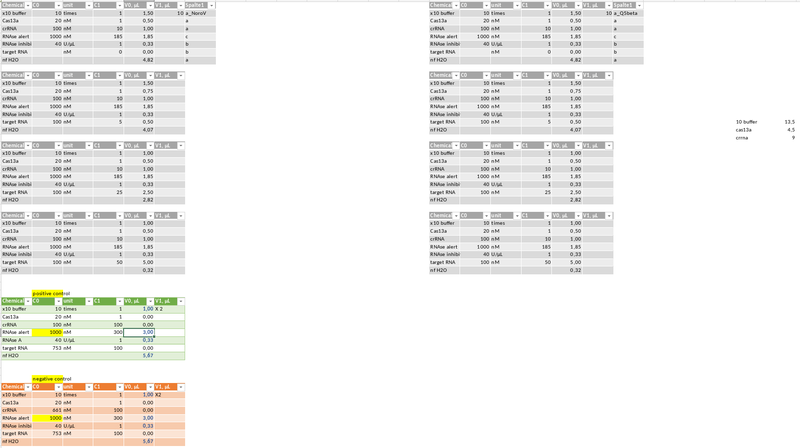 2x, 4x, and 6x buffer was used, which resulted in unspecific aggregation from 4x to 6x buffer, thus 2x was kept as standard. Transformation into E.coli Turbo chem comp. 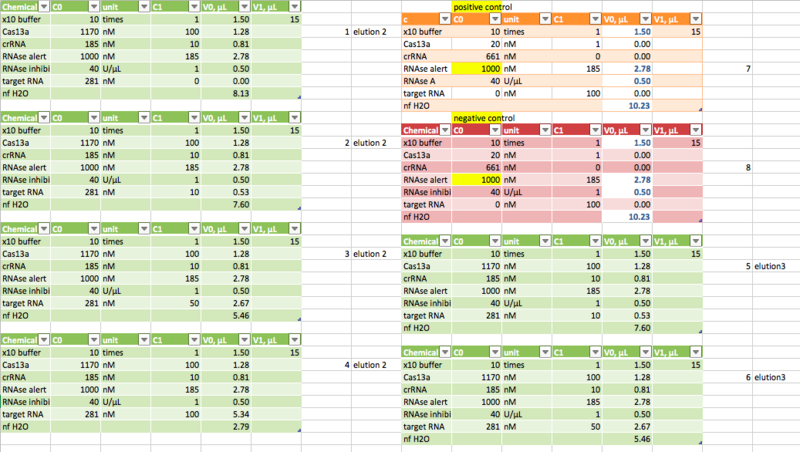 Plate reader experiment with different concentrations of RNA in vitro targets, positive and negative controls. 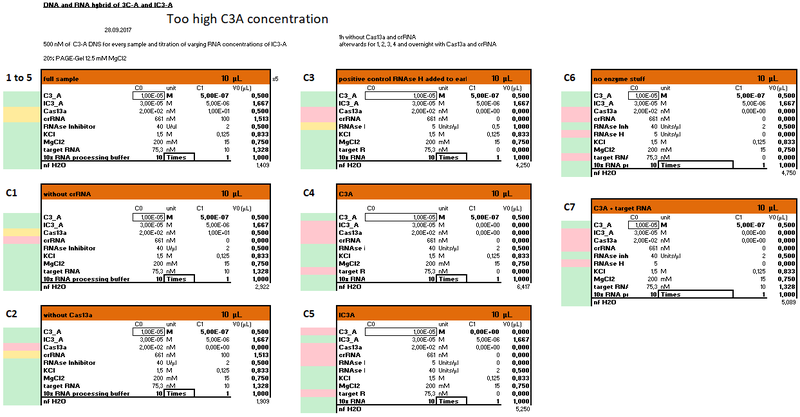 Plus assay with cas13a with TDPs and assay with RPA paper samples. No colonies for any BL21 strain. 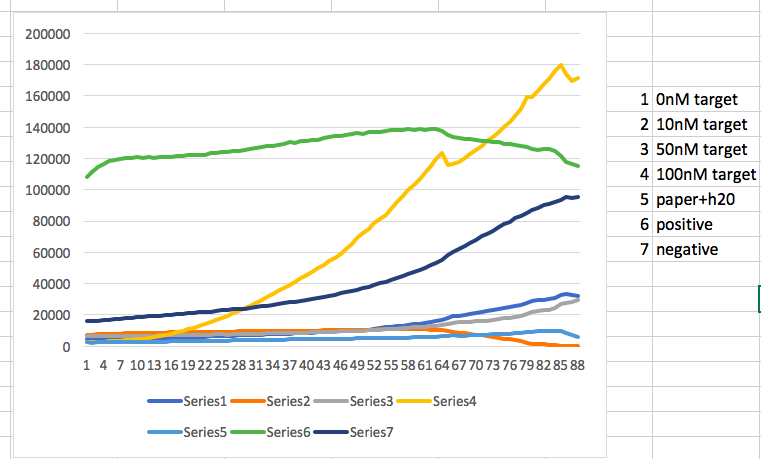 The Turbo cells grew fine. => Expression seems to be toxic. Water was used instead of linker-RNA. In vitro expression was not done, due to lack of time. 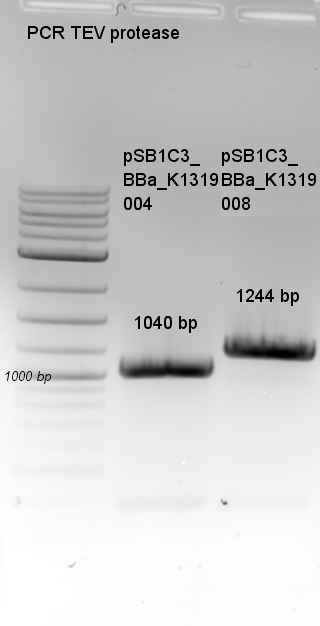 PCR of all GFP degradation tag library variants with Biobrick sequence binding primers, for transfer from psB1A3 to psB1C3. 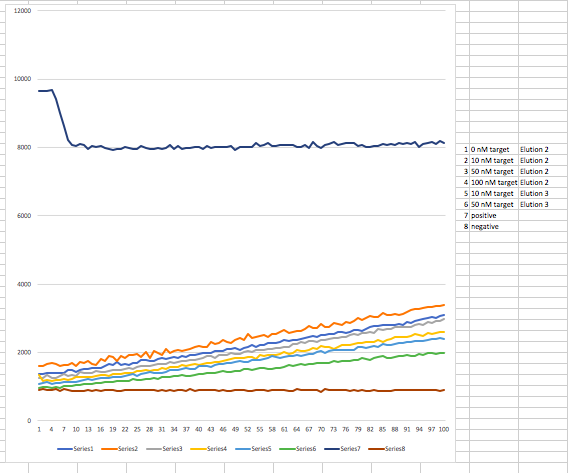 The experiment from the day before resulted in unspecific aggregation in the negative control. To have comparable samples and negative control for the cleavage assay, the experiment was repeated with a mock-DNA in the negative control. 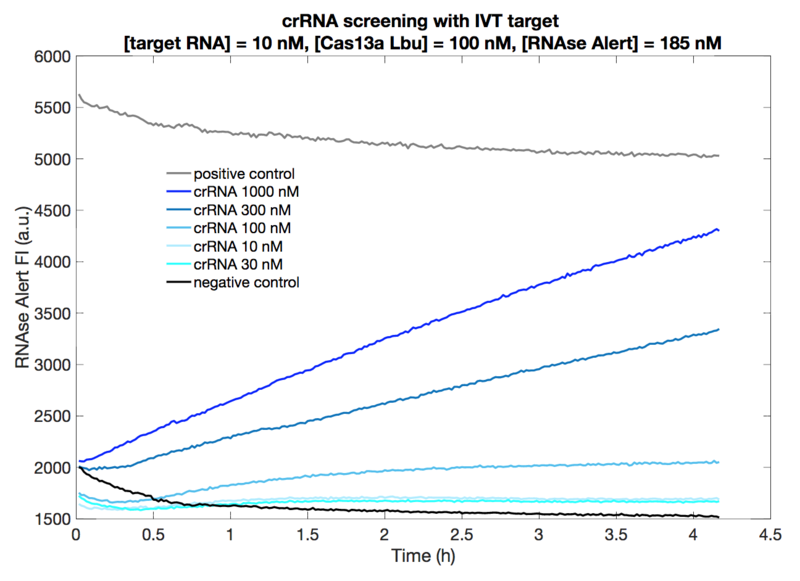 repeated with mock-RNA as negative control. 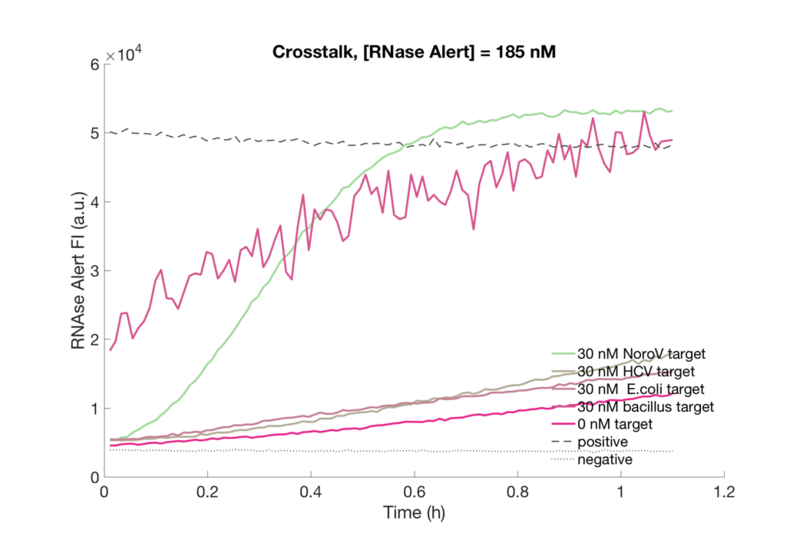 A possible explanation for this is that negatively charched, non-bound RNA in the solution increases repulsion of AuNP. 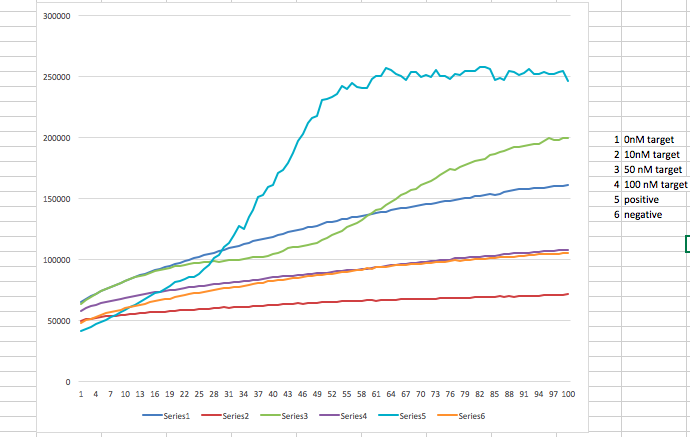 After cooling over night and spinning down for 1 min, just minor aggregation was achieved and samples were kept at 4°C for 2 days to allow for potential further aggregation. 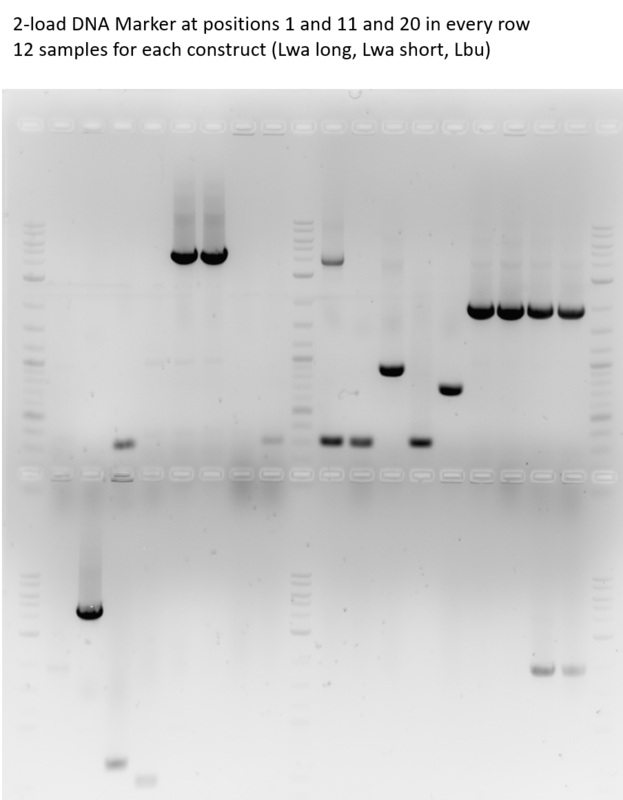 PCR reaction of G-Block using VF and VR as primers resulted in 50 ul of a 27 ng/ul solution. 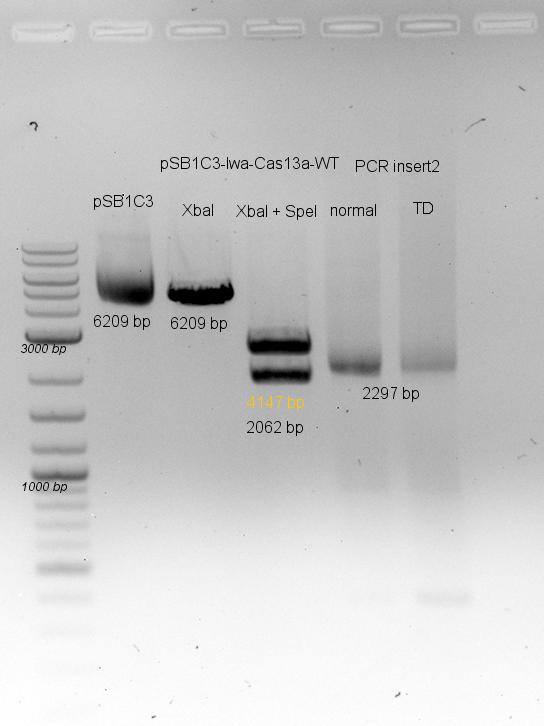 PCR reaction using pSB1A3_fw and pSB1A3_rev for backbone amplification of pSB1C3-GFP yielded 52 ng/ul. 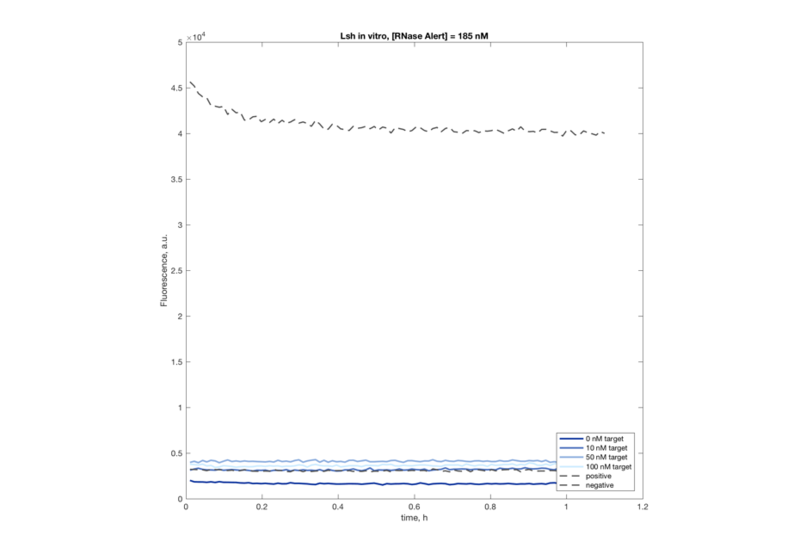 Ratio for Gibson Assembly: 0.375 pmol Insert : 0.125 pmol backbone. Incubation for 15 minutes at 50 °C. 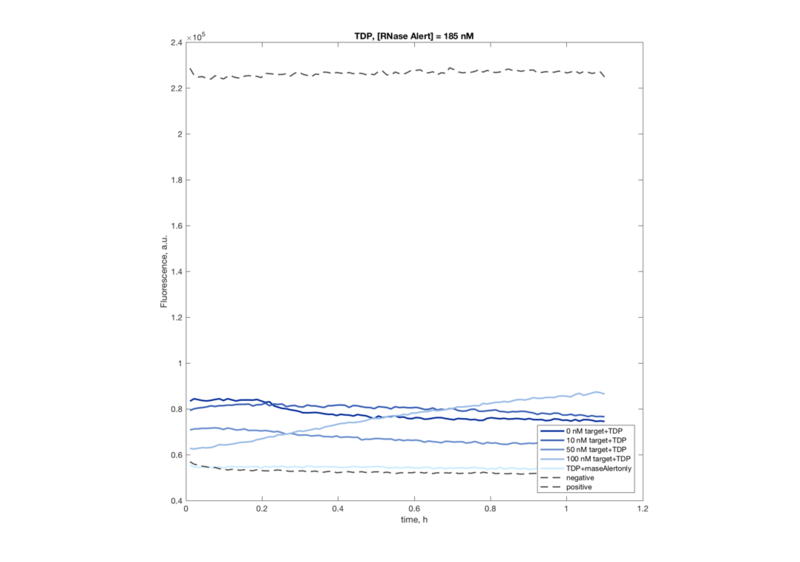 Simultanous dephosphorylation of backbone using Antartic Phosphatase. 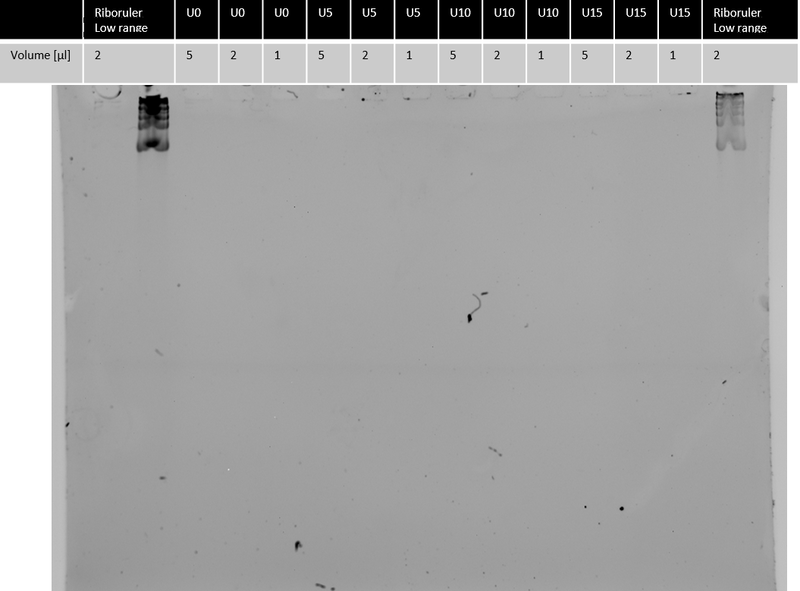 The investigation of the agar plates the next day using UV-light showed that for the Gibson Assembly, positive clones were visible. 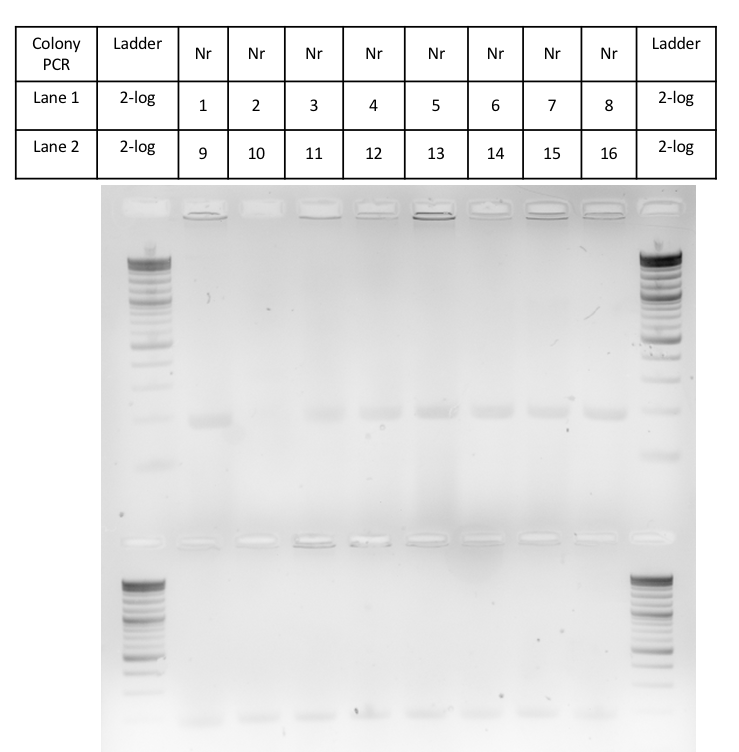 Colony PCR was performed and showed inserts for several plasmids. Overnight cultures were inocculated for sequencing. Mini-prep of previously inocculated overnight cultures and sent to sequencing. Since the PDMS chip was leaky, no real sample could be extracted from it. 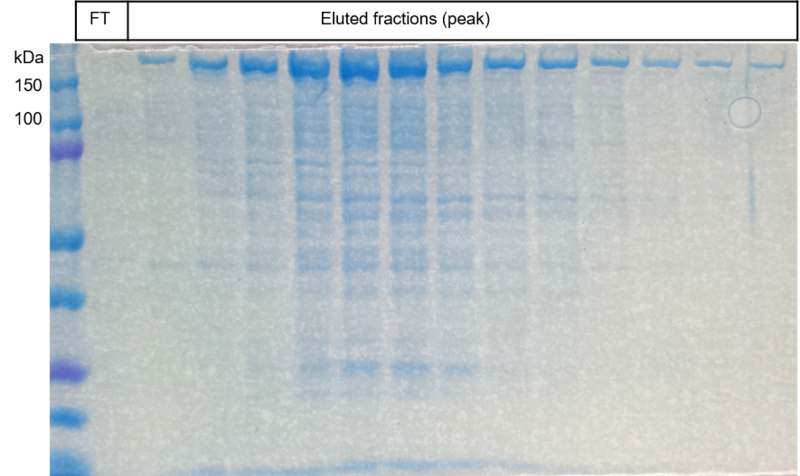 Positive Controls as well as colony-PCR using RPA showed clear bands on a 2%-agarose gel. 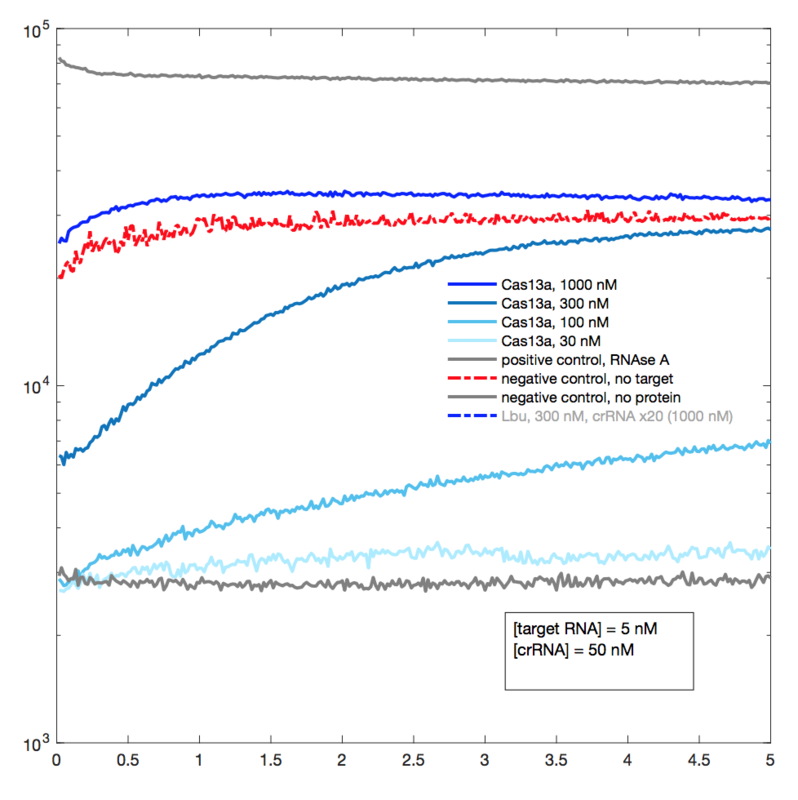 The RPA performed on Chip, however, was not showing any bands though Nanodrop concentration showed 27 ng/ul in the sample. After cooling over night and spinning down for 10 min, aggregates could be observed more clearly. No activity of Lsh Cas13a visible. Over-night linkage was started accoriding to the final protocol. 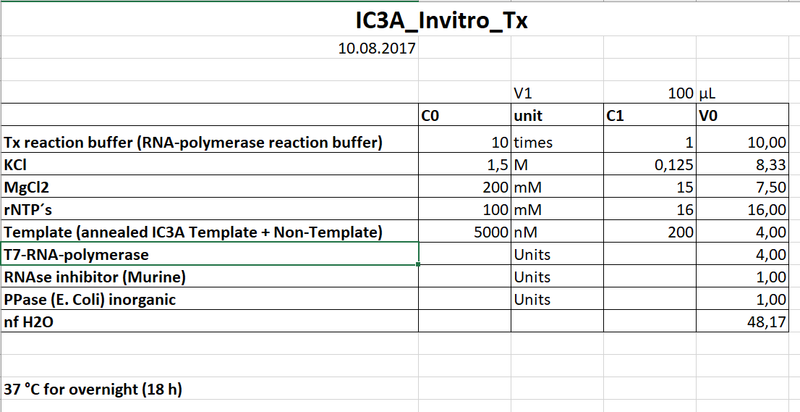 Plate reader experiments with lyophilized reaction mix with Cas13a Lbu with different concentrations of the in vitro target. Cas13a was added only immediately before starting the measurement. 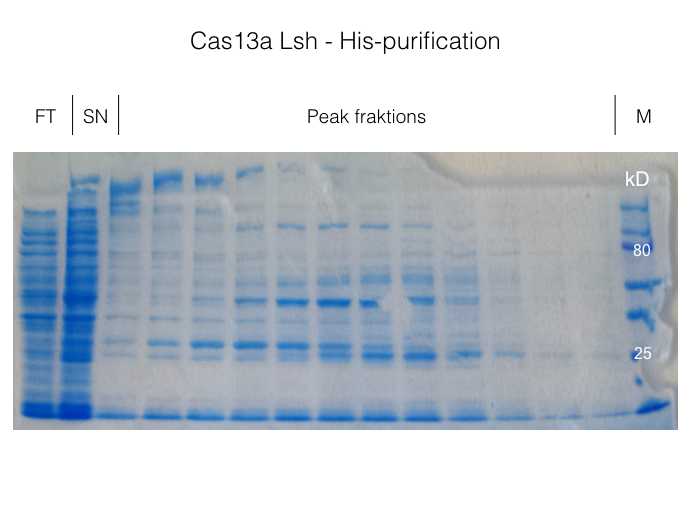 The activity of Cas13a is visible, but additional RNase activity was also seen. 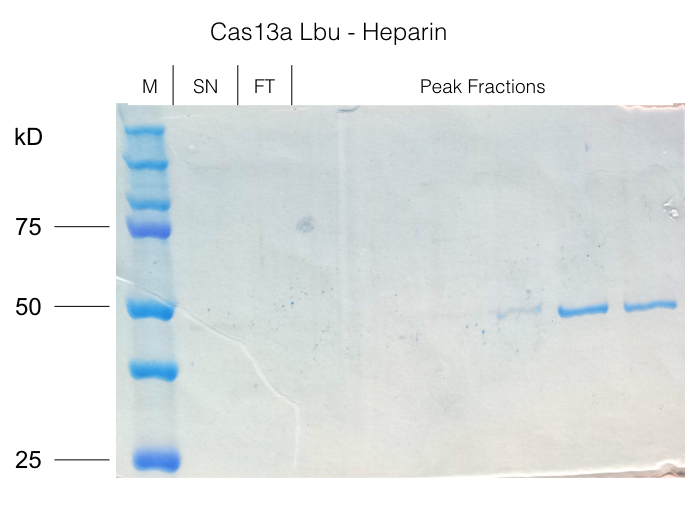 General control plate reader experiments with Cas13a Lbu with everything, without crRNA, without target, without Cas13a, positive and negative control. The spotted AuNP were visible as blue aggregates and red, unlinked AuNP. 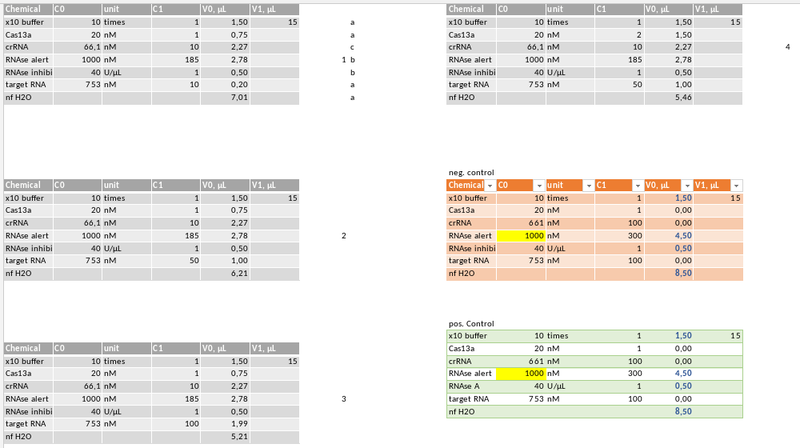 Plate reader experiment with Noro virus crRNA, Lbu Cas13a and different RNA targets from E.coli, HCV and Noro virus.